West, Ian, M. 2016. Lymington, Keyhaven area, Tanners Lane, Pitts Deep and other parts of the West Solent coast - Geological Field Guide. Internet site: www.southampton.ac.uk/~imw/Lymington-Keyhaven.htm. Version: 17th December, 2016. 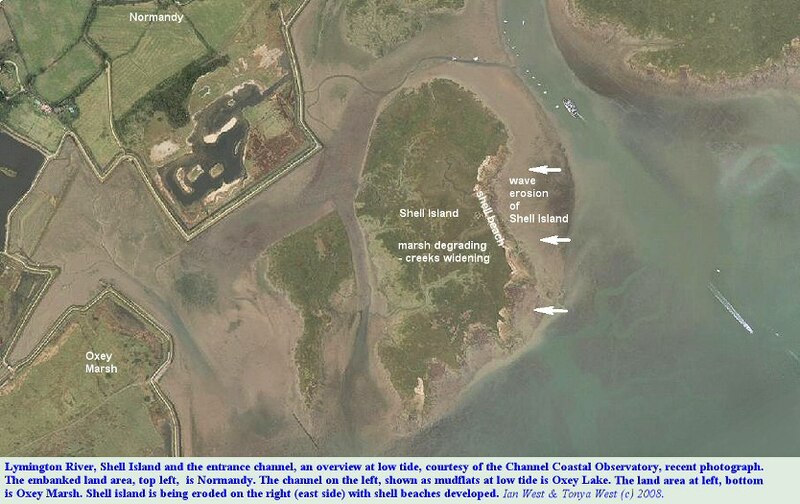 Aerial photographs by courtesy of The Channel Coastal Observatory , National Oceanography Centre, Southampton. 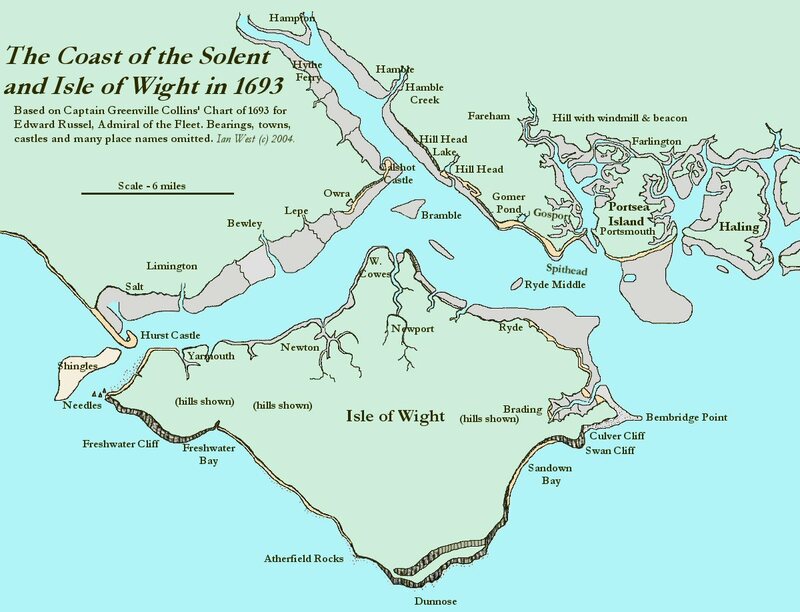 The western Solent is the valley of the Solent river, which flowed from west to east, flooded in the Flandrian Transgression. This view is towards the west. Near the left of the aerial photograph is the coast of Christchurch Bay, ending to the southeast at Hurst Spit. The conspicuous dark feature near the bottom of the aerial photograph is Parkhurst Forest. Appearing rather murky in the middle distance is the Newtown estuary where Pleistocene vertebrate remains occur. Bison bones are particularly numerous near the mouth of the estuary and mammoth remains occur too. 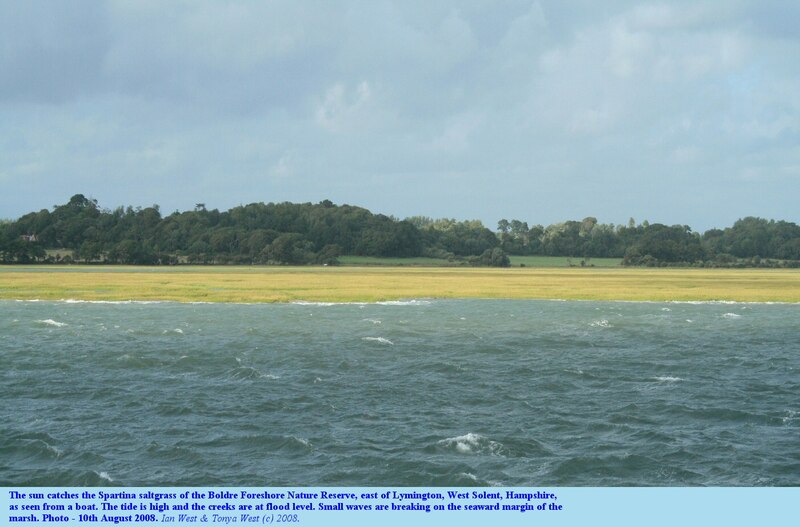 The Lymington River drains a wide area of the New Forest, and flows into the West Solent opposite the western end of the Isle of Wight ( Houghton, 1986). 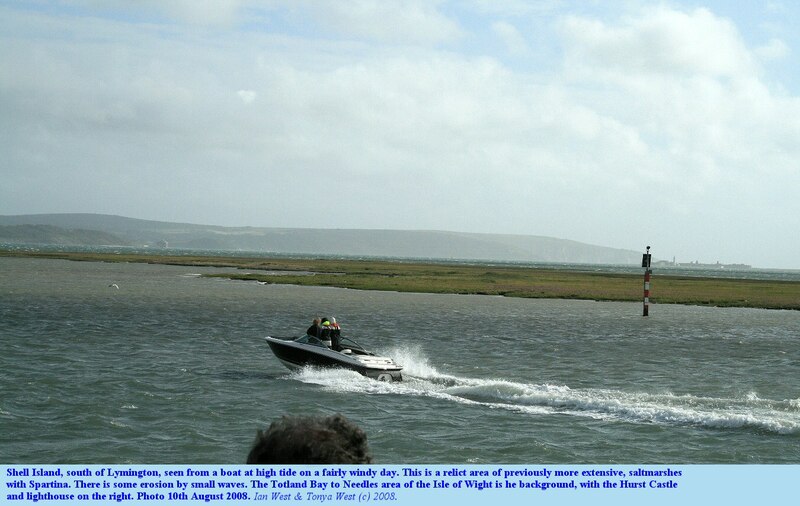 The estuary is one the smallest in the Solent and is tidal for approximately 2.3 km. 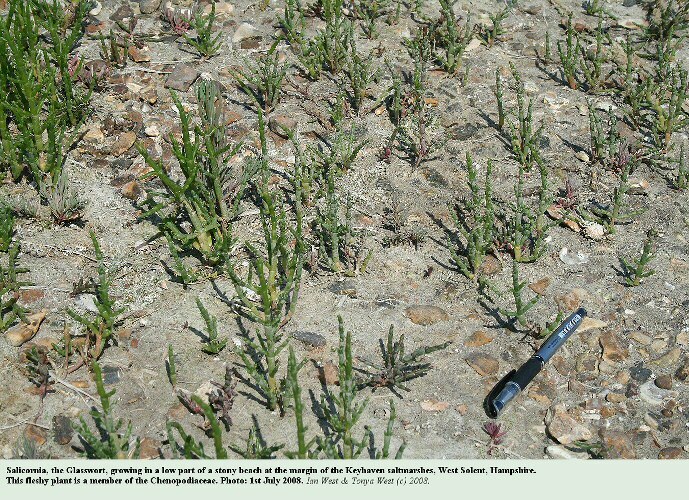 The average salinity at high water is about 30 ppt. ( Houghton, 1986). It was a notable place for the extensive Spartina saltmarshes around the mouth of the estuary, but these are now in quite rapid decline. 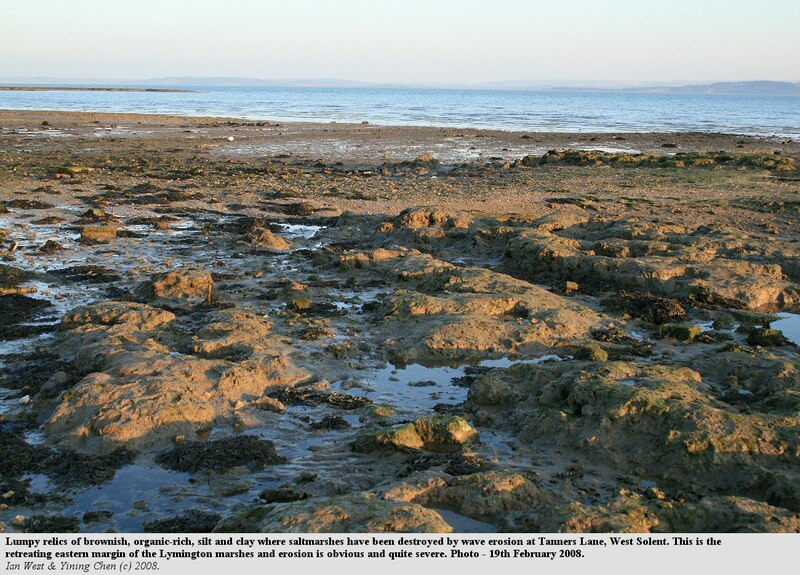 Houghton, (1986) examined six samples of silty sediments from around the estuary. They are normal for the region and are dominantly, organic-rich siliclastics. Quartz is high with feldspar very low. On XRD (X-ray diffraction) the quartz/feldspar peak height ratio averages less than 0.02. This is to be expected for this region of derived, Eocene, chemically-mature, siliciclastics. There is a little carbonate but it is very low, averaging 3.3 wt%. Of course, there would no reason to expect high carbonate, except locally as shell debris (e.g. in shell beaches). Coccoliths are present in the fine carbonate but are relatively rare. Organic matter is quite high, averaging 6.8 wt%. 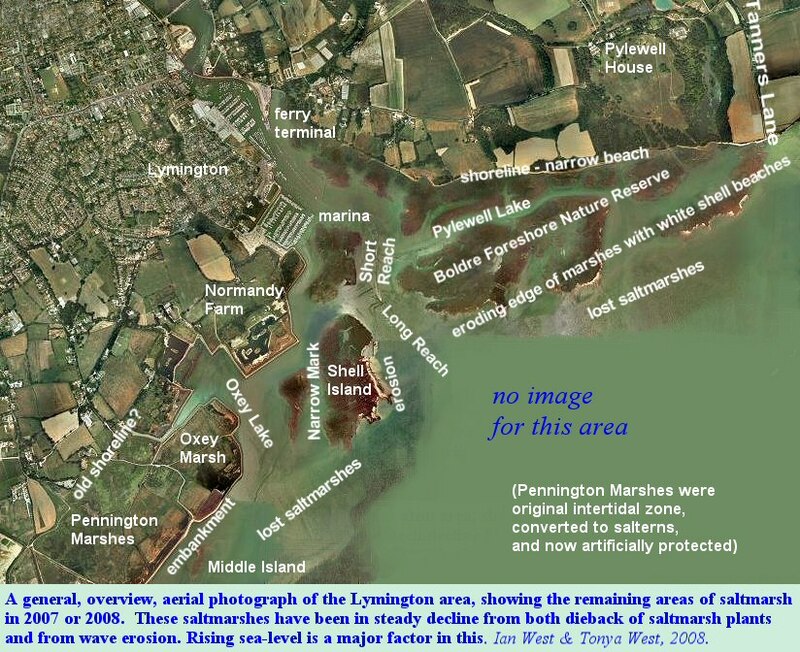 Most of Lymington Town is built on relatively high ground and is not in normal circumstances at much risk from flooding. Examine the old map of the alluvial deposits (Holocene sediments deposited by sea and river including those of floods and high tides). 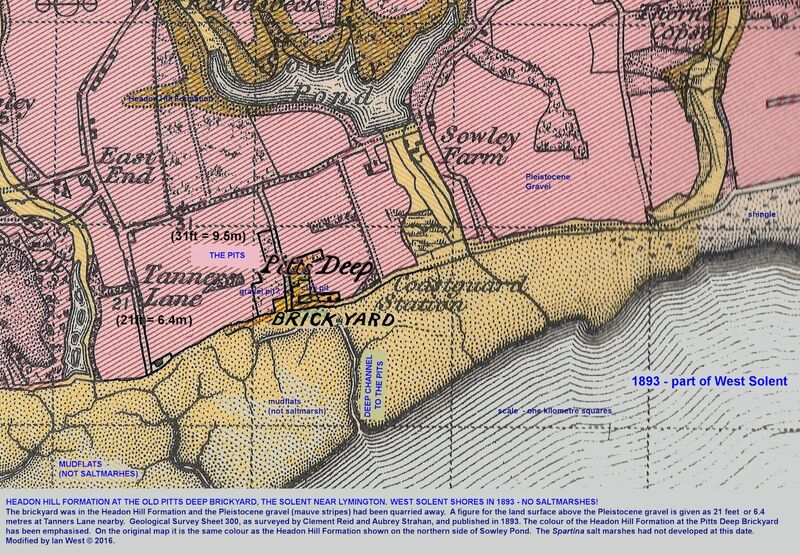 The 1893 mapping is superimposed on a more modern map and it is obvious that building has, in general, avoided the flood plain. Most of Lymington is on Pleistocene gravel terraces and on the Headon Hill Formation. Of course, with rising sea level the flood limit is likely to be higher in a hundred years time. 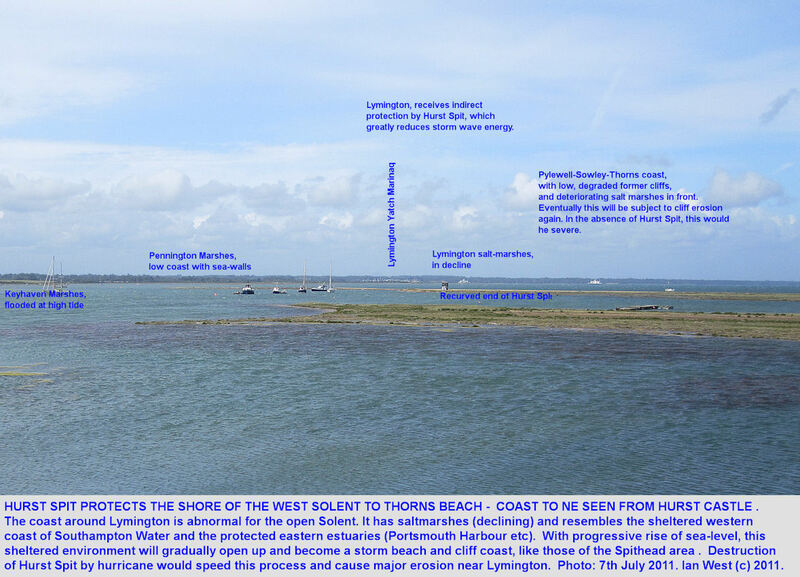 However, even a 60cm or a one metre rise would not affect more than a very small proportion, in terms of area, of Lymington. 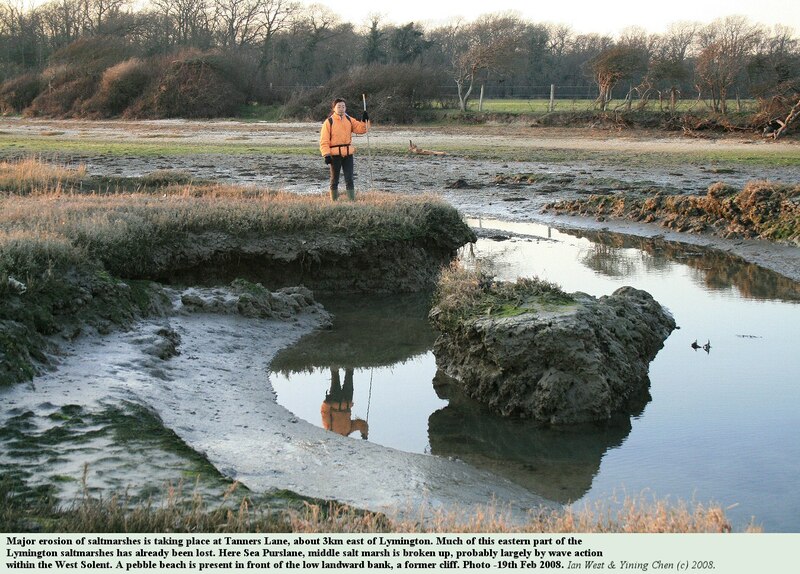 Lymington does not have a notable record for flooding, but this has obviously happened on rare occasions. 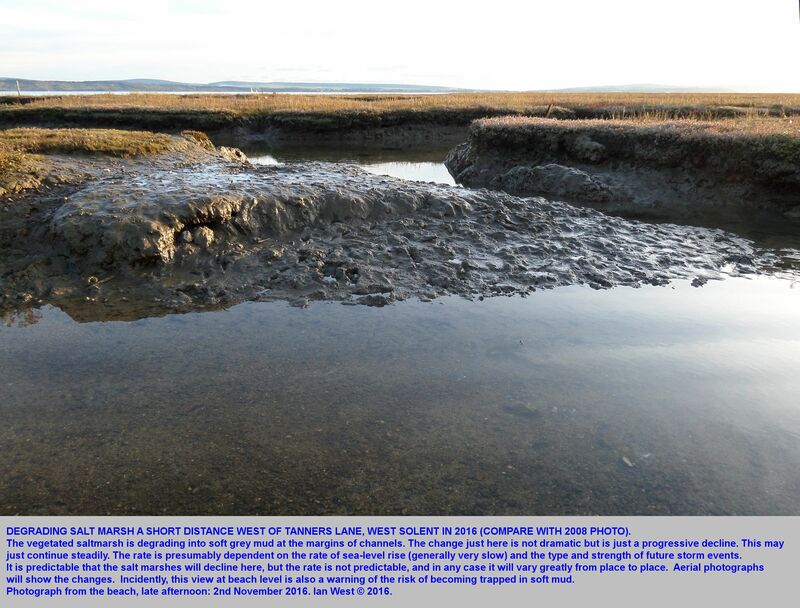 The general situation may be changing gradually because of slowly rising sea-level and progressive loss of saltmarshes which can retard wave action. There has not been any dramatic or sudden change though. The low areas of Lymington that are on the flood plain and not far above high tide level, are mostly near the Quay, the Yacht Club and some of the Waterford areas. For most of these areas there is protection by sea defences, although they are not always very high. 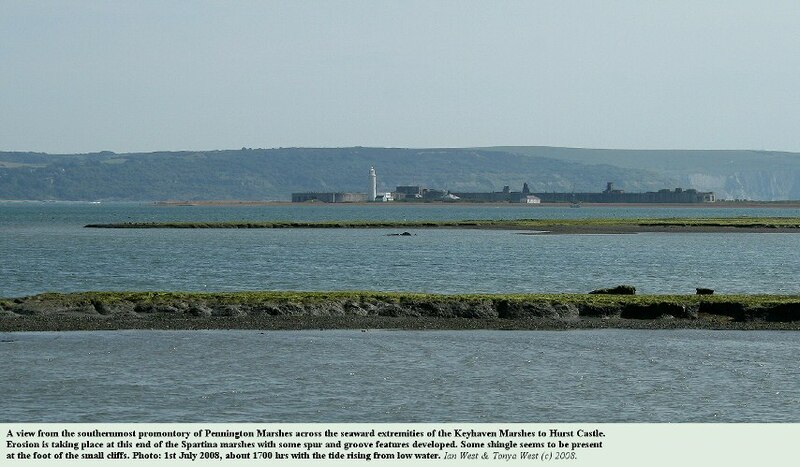 These defences are in the form of walls, above the quay level, with steel gates in places. Much higher and stronger sea defences extend around the Pennington-Keyhaven marsh area. These sturdy, wide and high banks should resist everything except a "Hurricane Katrina" type event. The marshes seem to be more strongly protected than the town, but there are probably practical reasons for this (access to quays and boats). 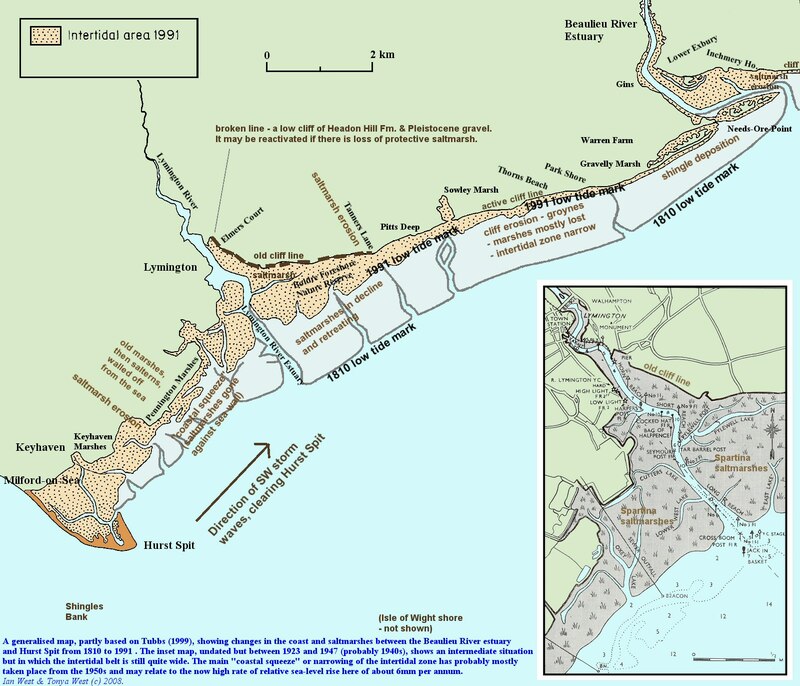 Environment Agency - Flood Maps. Enter an appropriate post code. flood risk map for Lymington. 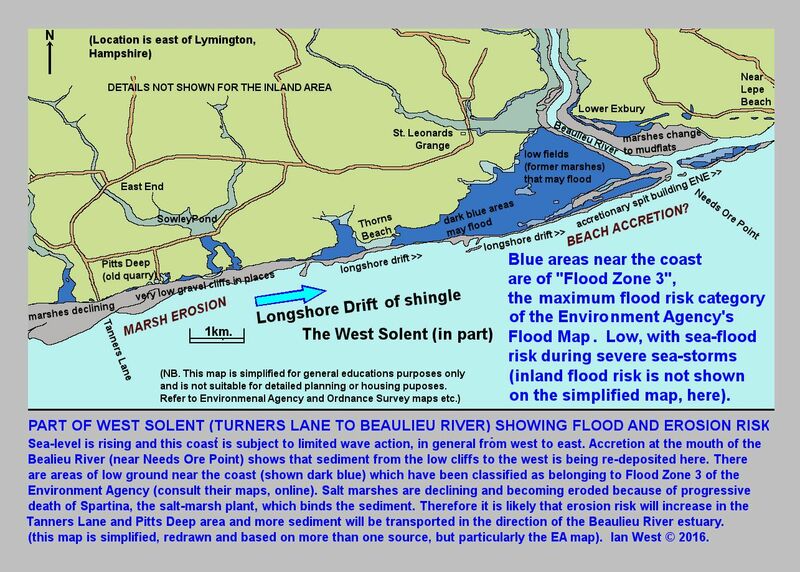 You will note that a significant area is shown that could have been flooded on occasions if there were no sea defences. Thus little, if any, of the town is at immediate risk, but some lower parts are dependent on the height and stength of sea defences. 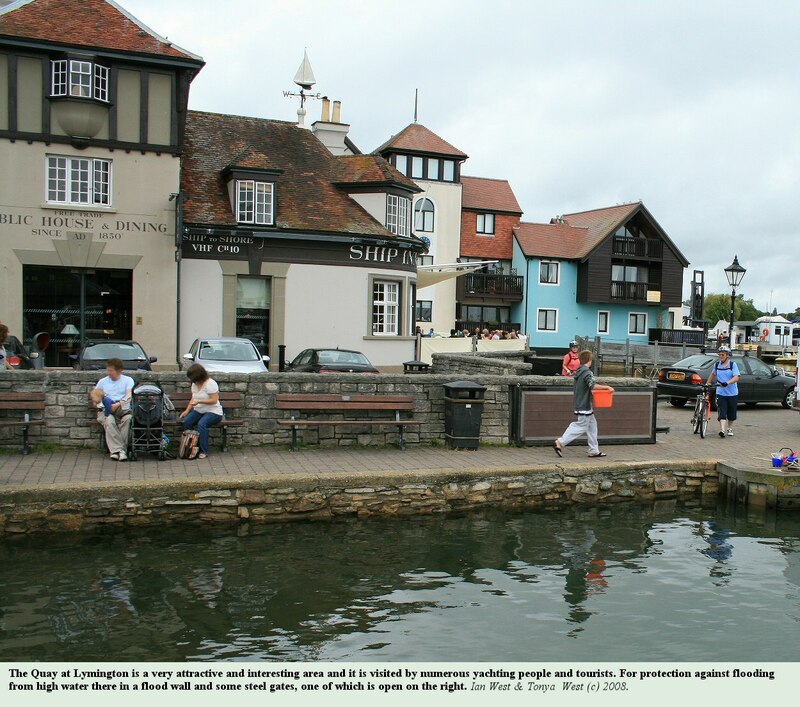 The additional sea wall, which rises above the quay surface level, probably deals with the usual storm events. Whether it is high enough to deal with rising sea-level over the next century is unanswered question. A high rate of 6mm per annum relative sea-level rise has been recorded at Lymington (there is both the present high eustatic rise and a smaller subsidence rate from isostatic rebound). A further risk factor, but one which applies to other places in the region, is the problem of the eventual return of the one in 250 year hurricane event (like the rare but great hurricanes of 1703 and 1824). This could happen any year. Storm surges of about 3 metres or so above high water mark are possible in extreme events, especially there is the chance coincidence of a hurricane and a high spring tide (as in 1824). "Chesil Beach had been breached in 30 places" (Arkell, 1956). The storm began about 7am on 26 November 1954, and increased in violence all day. The Shambles light-ship recorded winds of gale force 8. 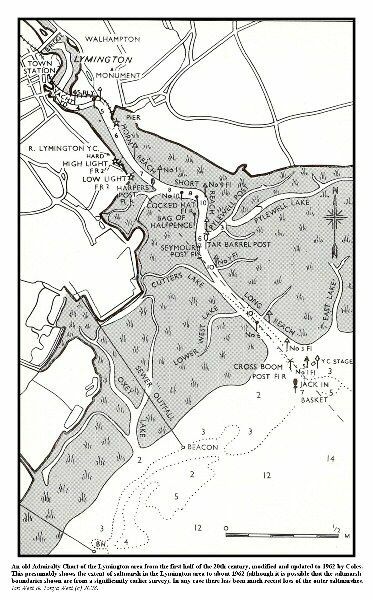 The Dorset Daily Echo for the 27 November states that by 11pm on the 26th "Boiling seas, surging over and up through the Chesil Beach swamped the main road.. A stretch from Ferry Bridge to Portland Square lay under water up to a depth of 4 ft. in places... Wyke coastguards counted 30 holes where the seas had worked through the Chesil Beach... A stretch of wall about 40 ft in length skirting the oil tanks was smashed down." 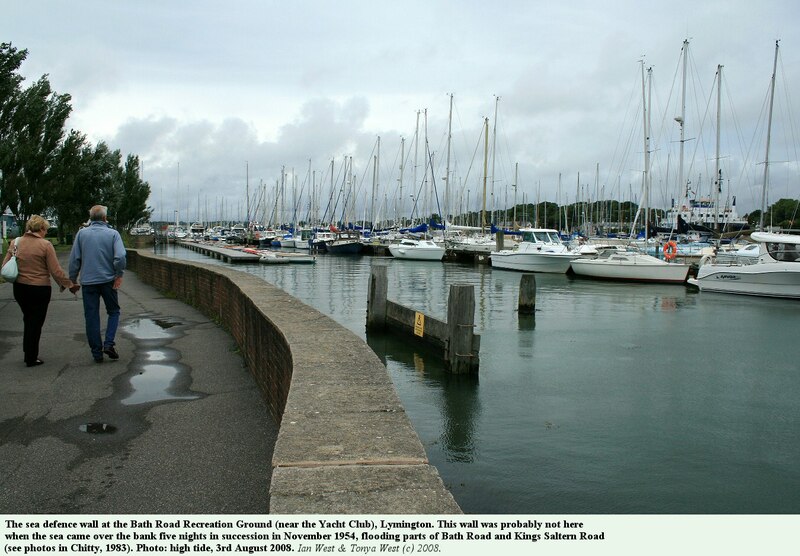 The 1954 storm affected Lymington. 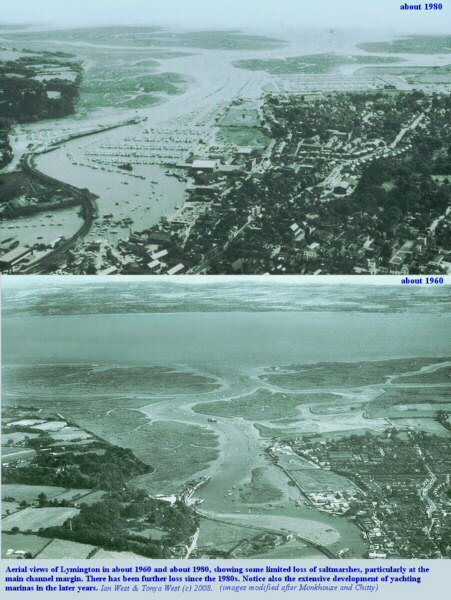 There were floods for five nights in succession from 26 to the 30 November 1954 when the sea came over the west bank of the harbour. Here is a statement from a resident about the flooding, reported in Chitty (1983). It refers particularly to a guest house (still there) in King's Saltern Road. 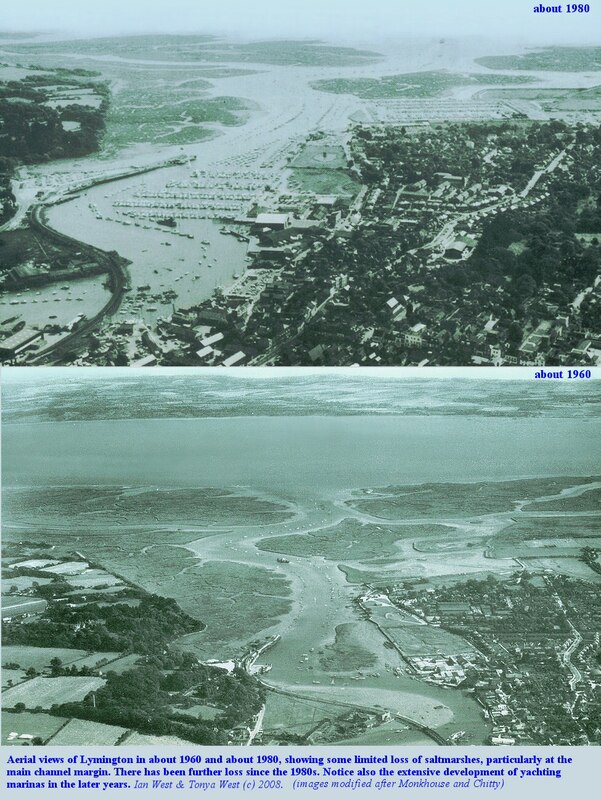 "Then there were the floods in 1954. We had 2 and half feet of water [this might have been in a semi-basement - not clear]: it just trickled over the top step and when the tide went out, so did the water - it went through the floor. They started pumping but they didn't get it all. The Butchers lived opposite us then in Bath Lodge [there is also a photograph of a dinghy being rowed to the entrance of Bath Lodge] and of course Doug was a weatherwise man and said 'There is going to be a very high tide tonight. If it comes up to us can we come over to you? We said, 'Of course' you can'. They already sent the children up to his mother because there was an east wind, a lot of rain water coming down the river and the Spring tides: a formidable combination. Tanners Lane is small quiet lane south of East End. It gives some access to the shore of the western Solent. In fact it is the only place between Lymington and Lepe Beach where the public can get access to part of a very private coast. 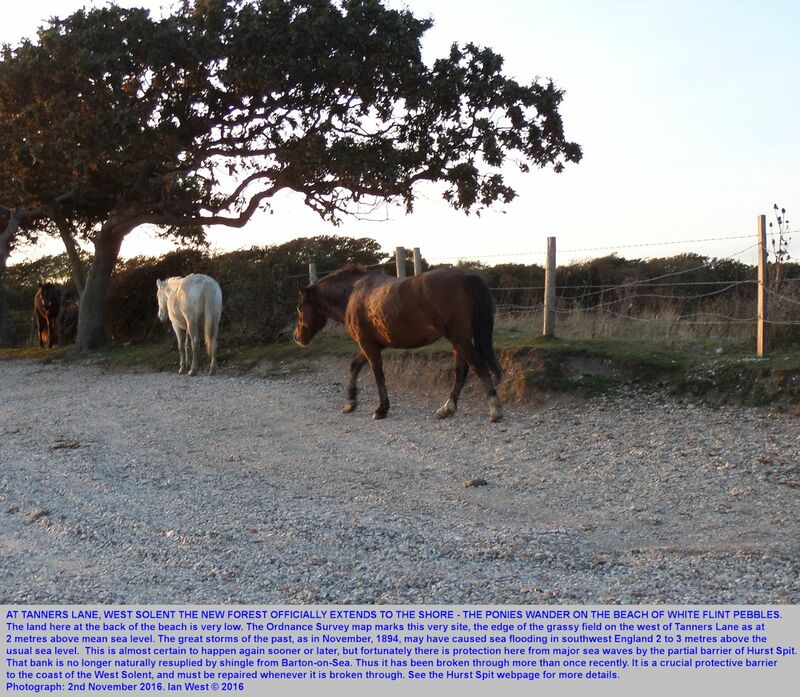 It is a narrow lane and a quiet place with New Forest ponies wandering. 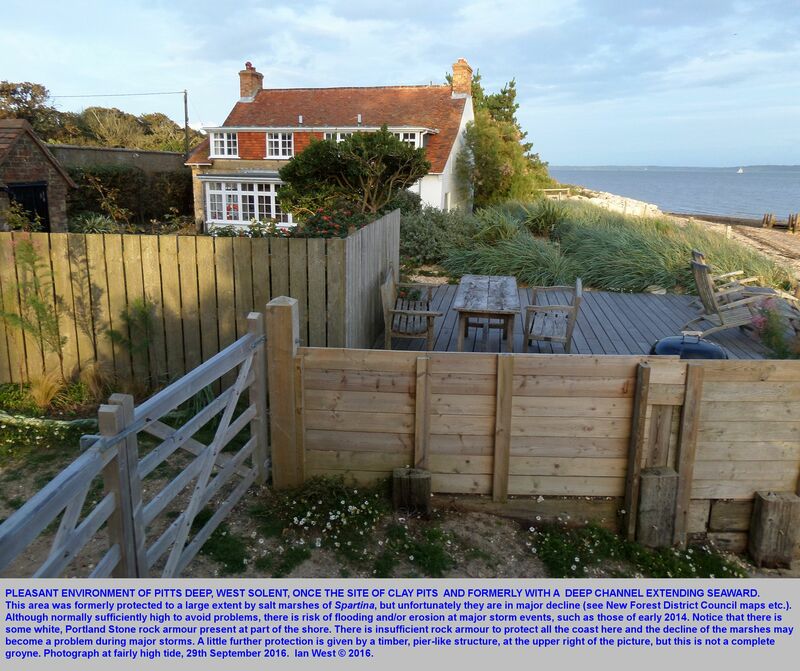 There is just one private house there, and that is adjacent to the shore, protected by a sea wall. Individuals could walk down the lane or use a small car for a brief visit. It is a totally impossible place for large vehicles such as coaches, which could not turn around at the end. 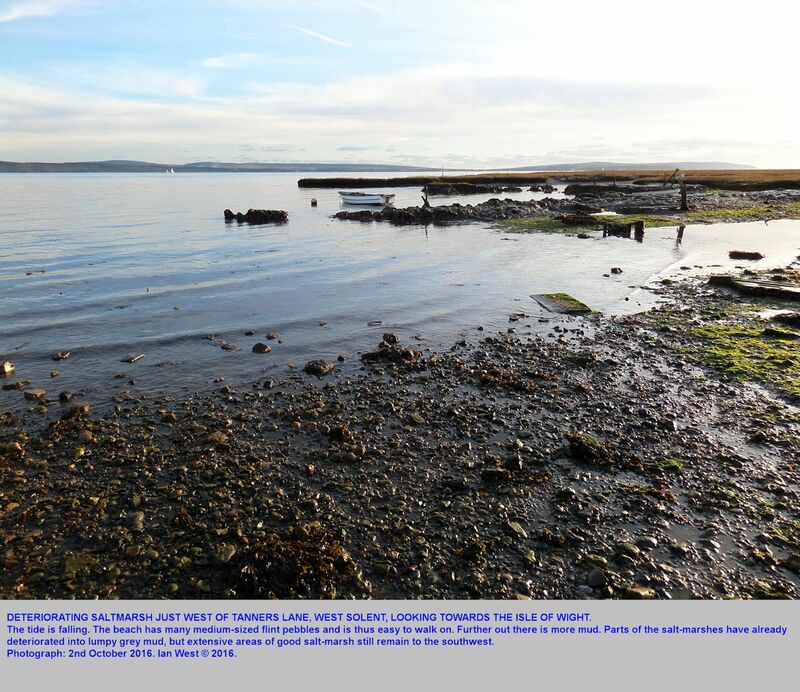 The exposures are very limited and you cannot walk very far unless the tide is out. It is, of course, undesirable to disturb the few local people. 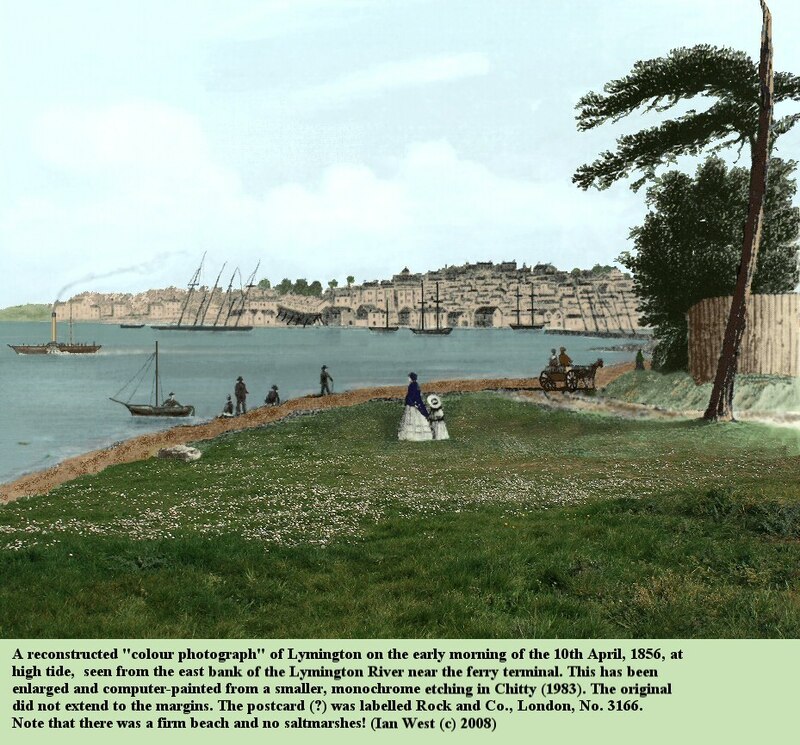 However, the seaward end of Tanners Lane does enable individual persons to see the character of the mainland coast of the western Solent. The low cliff shows interesting erosional features and also an interesting soil profile with podzolised, white pebbles and some gleyed clay beneath. 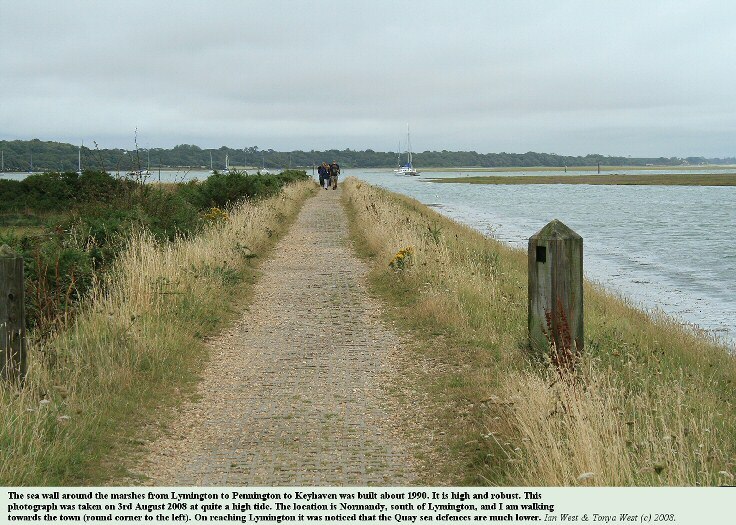 [Note that there is no major coastal footpath here, as there is west of Lymington]. Notice from the photographs just how low the land is at Tanners Lane. The fields at the back of the shore are seaward of the 5 metre contour line, and in theory they could be flooded by a rise in water level caused by a severe storm (or possibly a local earthquake). 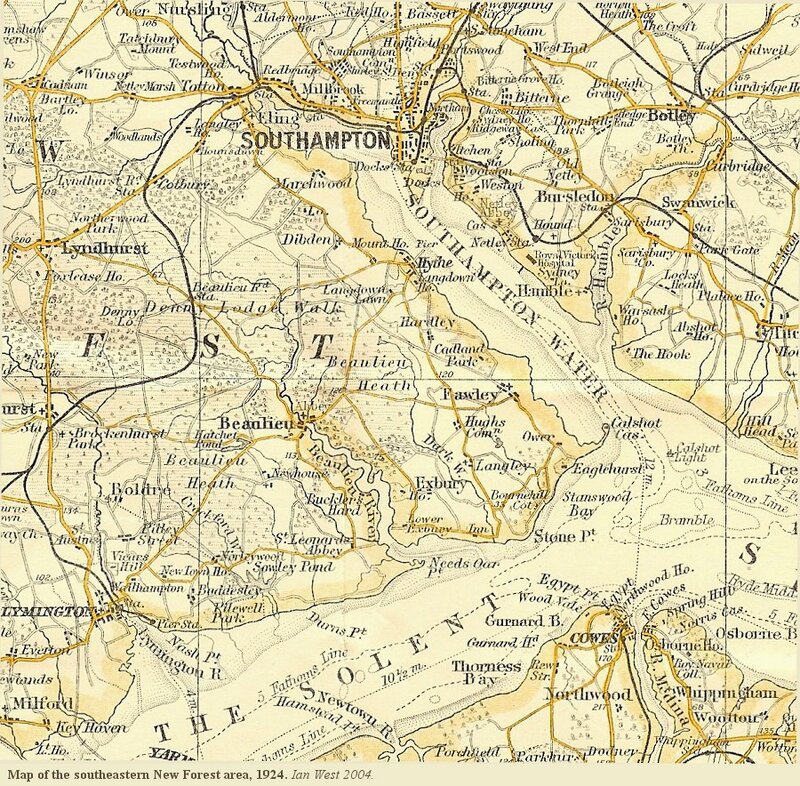 A similar situation exists at Pitts Deep and further east towards Warren Farm and Need Ore Point. There are some geological or geomorphological problems regarding the origin of this low ground. 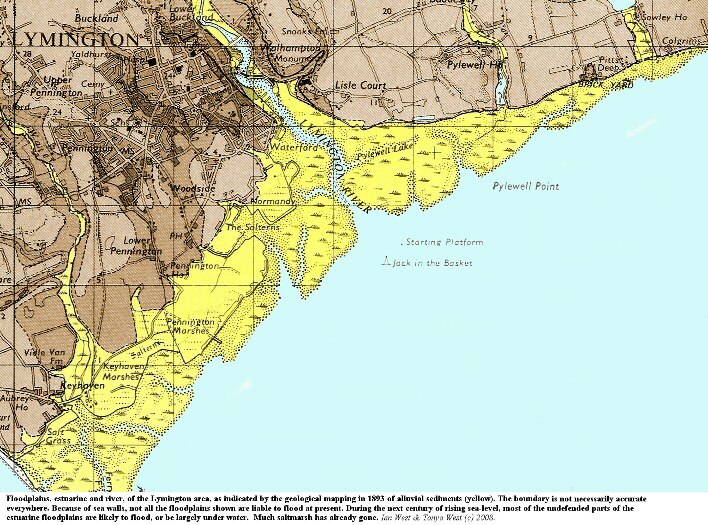 The area depends upon protection from the open sea by Hurst Spit. As shown above, just to the west of the shore end of Tanners Lane there are deteriorating relics of saltmarshes. Photographs above show parts (not necessarily the same parts, but adjacent) in the year 2008 and in 2016. 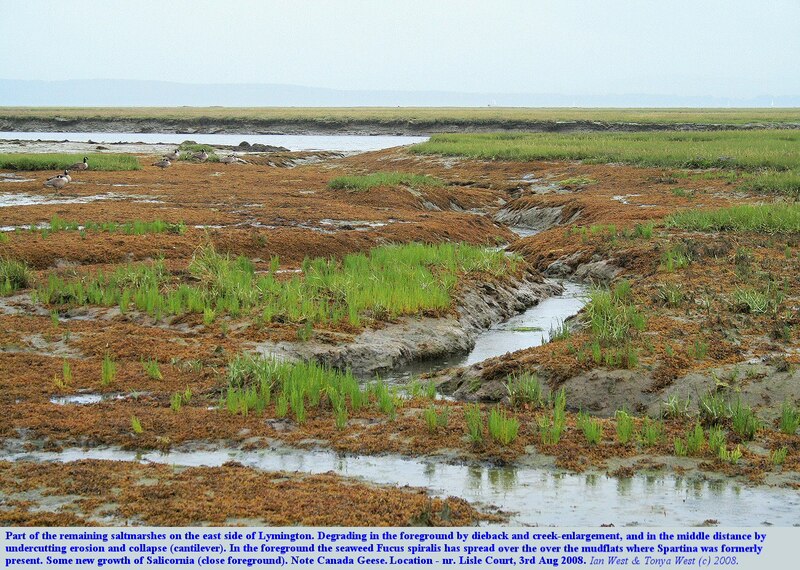 The salt marsh is being destroyed by the death of saltmarsh plants and by sea erosion, but the process is quite slow. There is rather less change than you might expect in eight years. 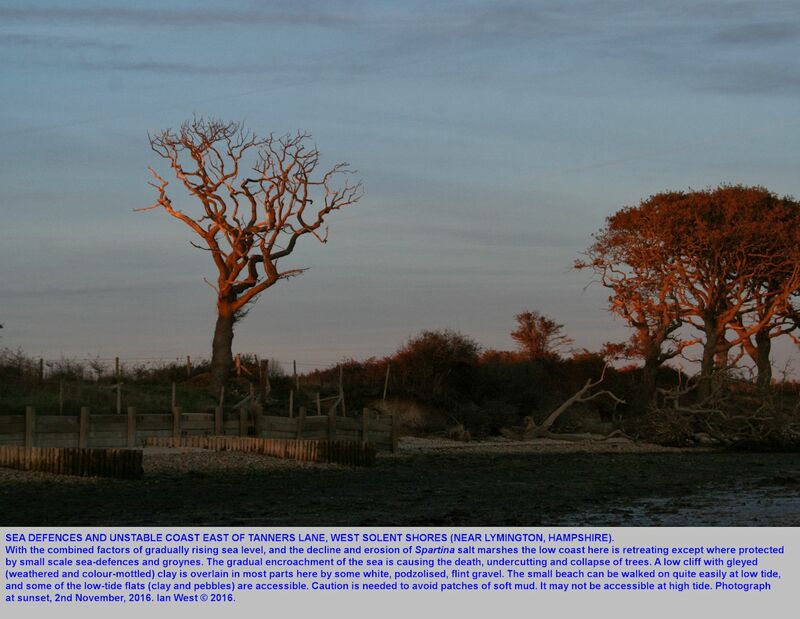 A conspicuous feature, both east and west of Tanners Lane is the collapse of trees which formerly bordered the salt marshes on the landward side. It seems that the erosion of the low cliff has increased recently and thus caused the detruction of the artificial tree line. A notable feature of the beach and cliffs just east of Tanners Lane is the abundance of white, medium-sized, subangular flint pebbles. They appear as a completely podzolised pebble bed, about a metre thick or less in the cliff. This pebble bed is peculiar, without obvious stratification and occurring at a very low level in relation to present sea level. It does not resemble other (Pleistocene) pebble beds of the New Forest region. They are poorly sorted, have sedimentary structure and often much larger pebbles occur. 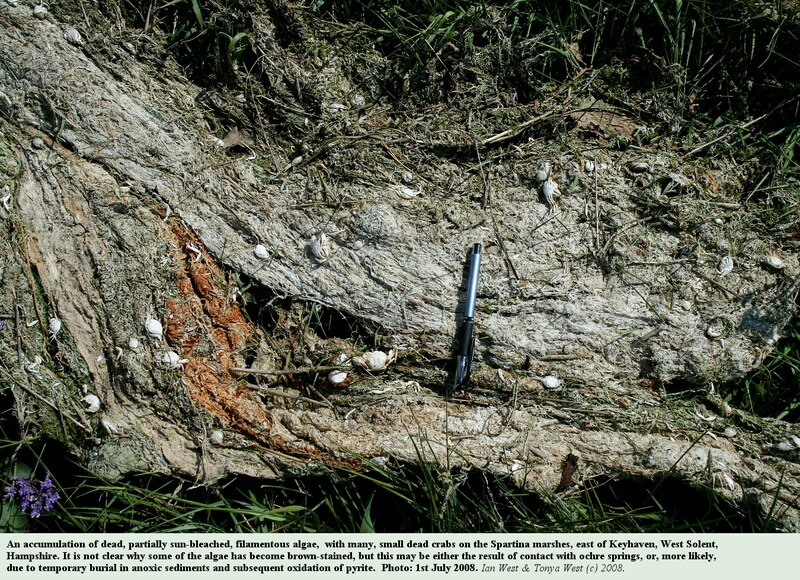 In addition they often show iron staining at the base of the Podzol profile, and sometimes an iron-pan. The peculiar pebbles here show conchoidal fractures and no significant beach-rounding. There is a remarkable lack of iron-stained, flint pebbles, such as usually occur, as mentioned above, at or near the base of of a Pleistocene flint pebble bed. The pebble bed in the cliff is certainly abnormal. The erosion of the cliff and the release of these remarkable pebbles has produced a strange white pebble beach. 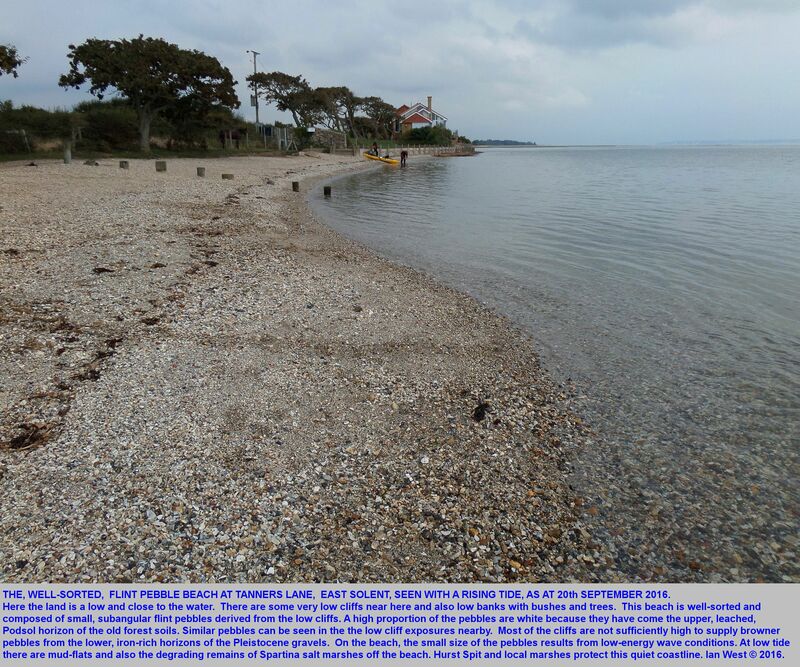 The consequent beach assemblage seems to be travelling eastward by longshore drift, and there is a substantial accumulation (apparently from aerial photographs) about half way between Tanners Lane and Pitts Deep. More investigation is needed. 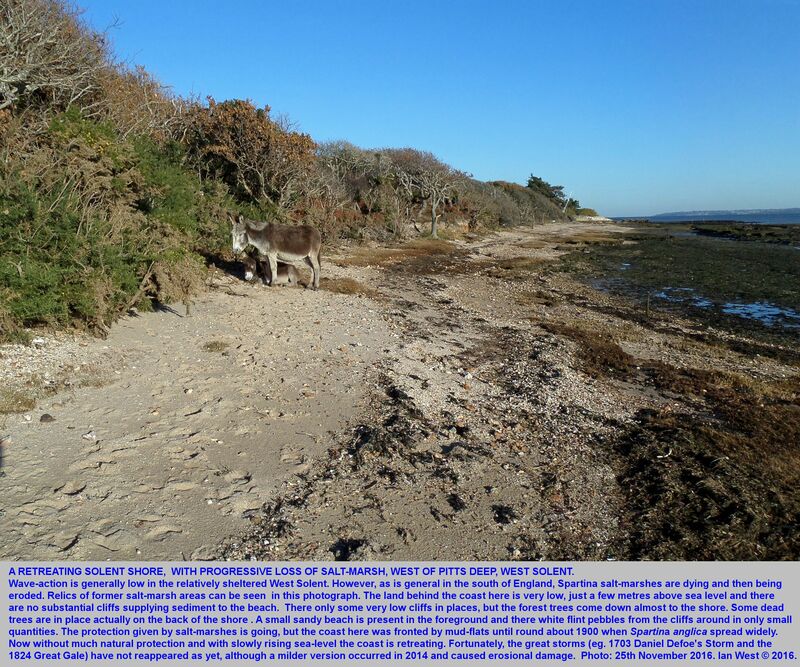 Compare the above two photographs of the same locality, immediately to the east of the seaward end of Tanners Lane (Solent coast, east of Lymington). In about eight years there has been some degradation here, but it has not been dramatic, at least so far, at this particular site (a place easily seen from the beach). Pitts Deep has been an important crossing place from the mainland to the Isle of Wight since at least 1587, and probably earlier. 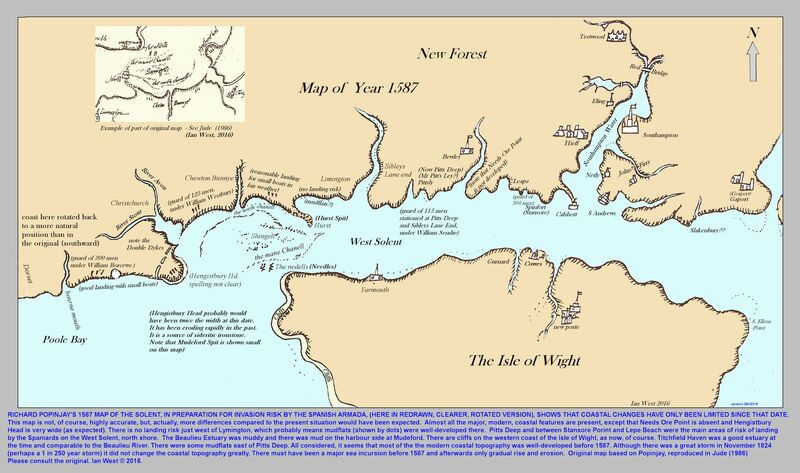 Shown below is a redrawn version of Richard Popinjay's 1587 Map of the Isle of Wight, Hampshire and Dorset defences against the Spanish Armada. The original map, which is shown in Jude (1986, p. 21) is difficult to read, partly because the south side is shown at the top (i.e. inverted compared to modern practice) and partly because the writing is not easy to read. This redrawn version shows the main features fairly clearly. 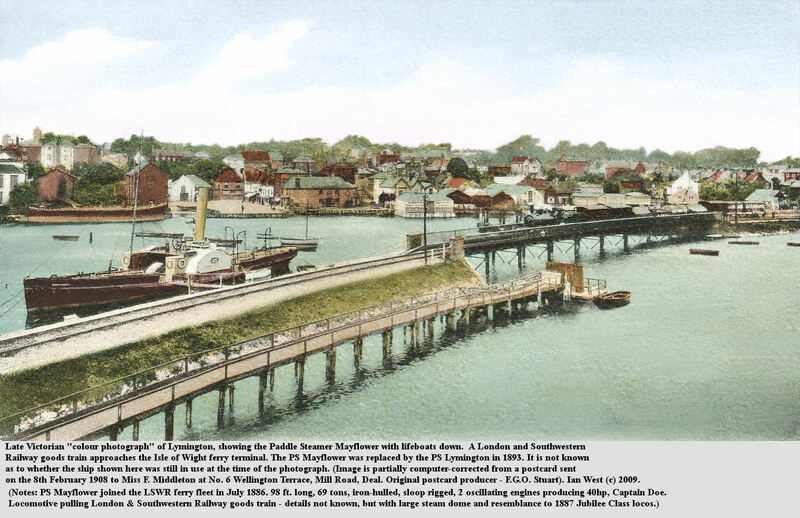 Surprisingly, the coast has not changed greatly since that date, 1587 but there have undoubtedly been local changes. 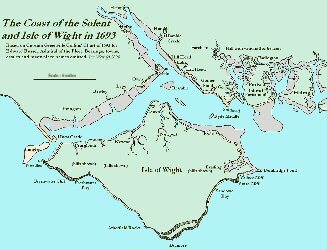 Therefore, in spite of some storm modification, the main substantial sea-level rise and major expansion of the Solent before that date. Exposed in the eroded beach directly to the west of Pitts Deep there are very large rusty chains. 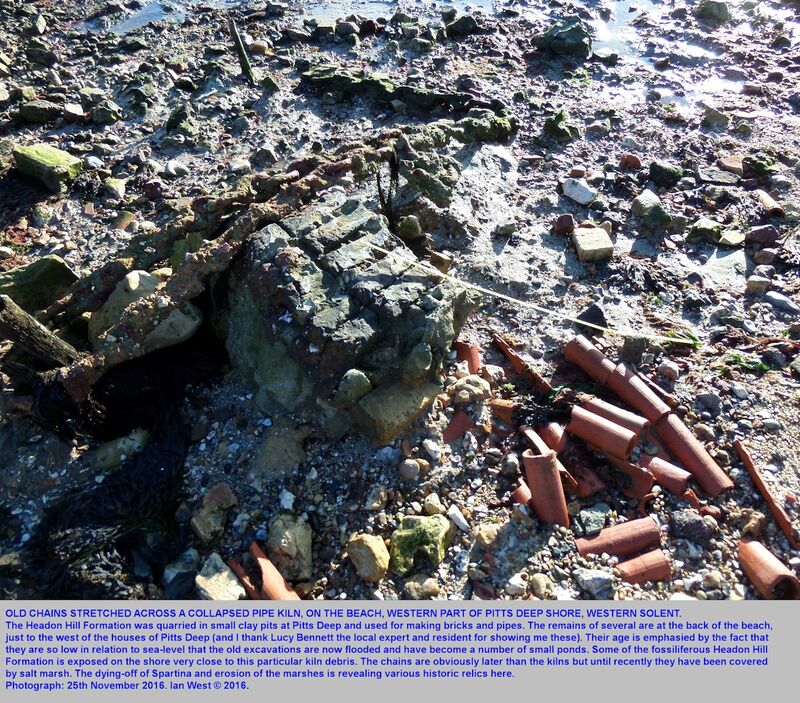 These are above the remains of pipe and brick kilns on the beach, and therefore later than the kiln activity. They are below the modern surface. It is not really clear as to what they are. Similar ones in South Wales have been attributed to defences against tanks in the second world war. However, chains like this are also present at Bucklers Hard, Beaulieu, a less likely place for tanks to land in wartime. Uncertainty remains. 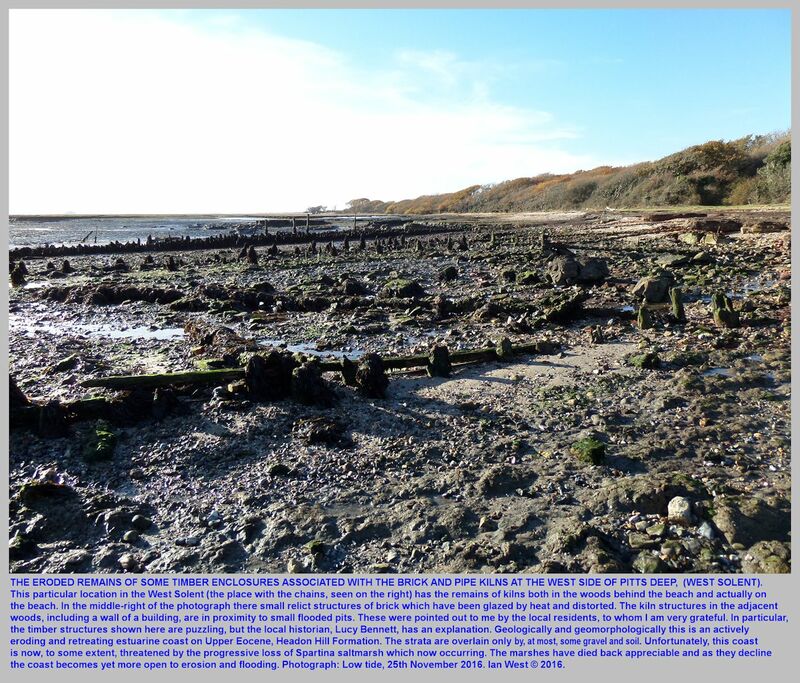 A small amount of contorted green clay, much of it full of white aragonitic shells was found at the old pipe-kiln remains on the beach at Pitts Deep. It contains the late Eocene, freshwater gastropod, Potamides vagus, scattered through it. 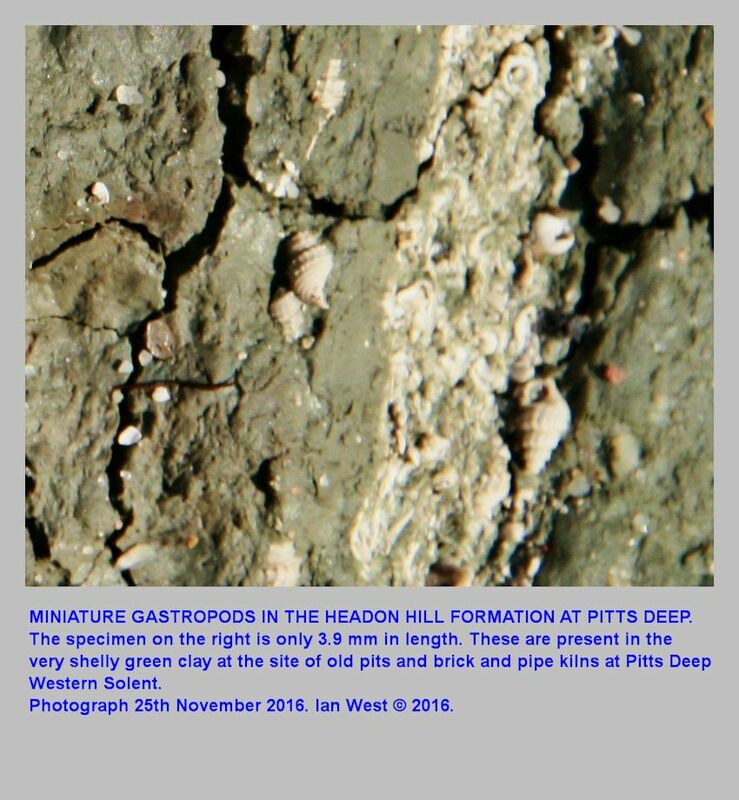 That gastropod is characteristic of the Headon Hill Formation. With it is an assemblage of numerous very small shells, including both bivalves and gastropods. 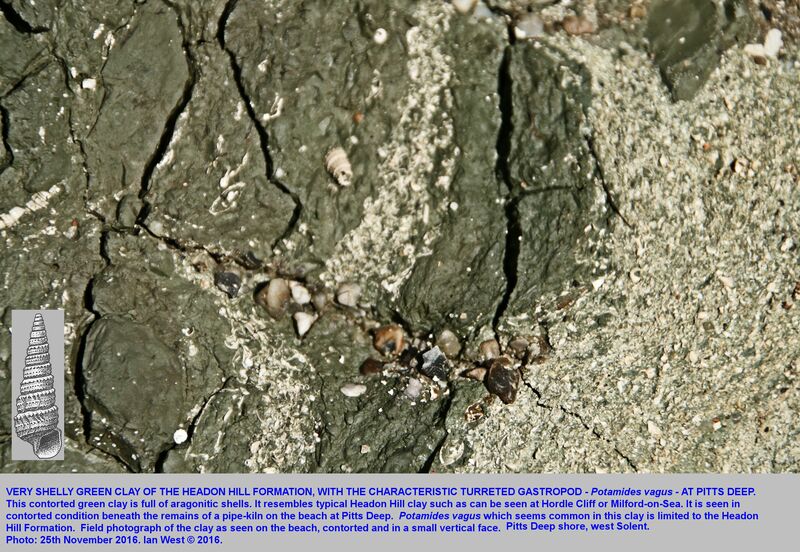 The miniature gastropods seen are probably Tarebia sp., according to Alan Morton, the Eocene fossil specialist. Go to his website A Collection of Eocene and Oligocene Fossils. Compiled by Alan Morton. 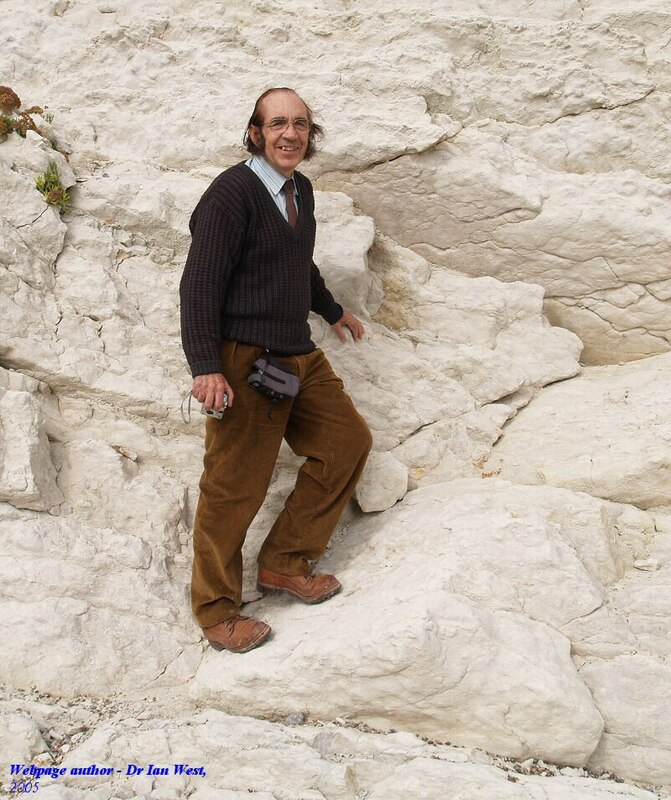 "This Web Site displays more than 2,000 of the characteristic fossils of the Eocene and Oligocene deposits of England. It is hoped that this provides a useful resource for those wishing to identify their own fossils. Comments and suggestions about the content of this Web Site are welcomed, including any suggested corrections or additions to the naming of the illustrated species." The clay with the abundant fossils is not in situ and the bedding is contorted but near vertical. 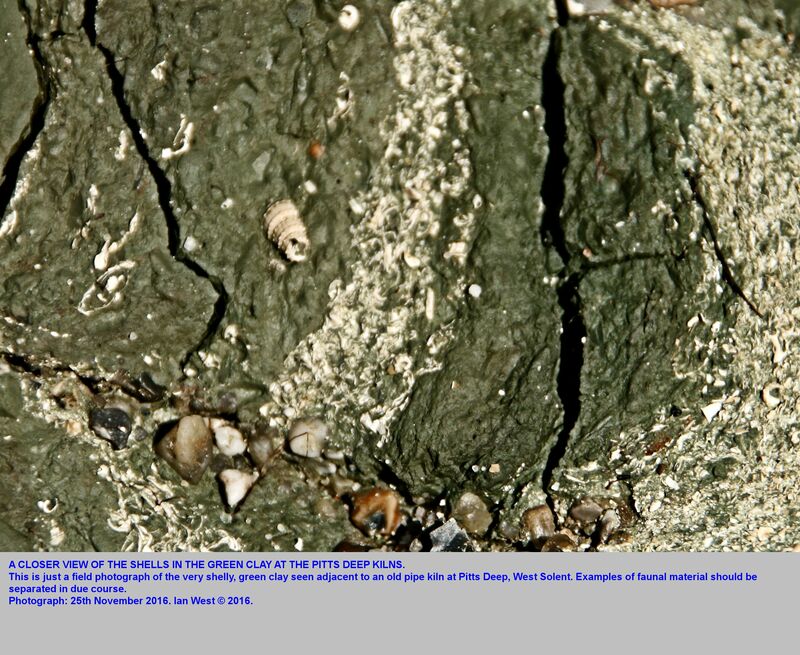 There is some less fossiliferous green clay present nearby, as shown in a photograph above. 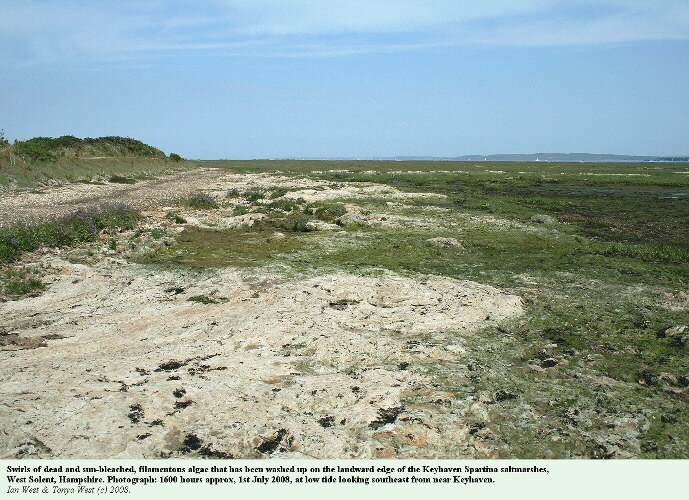 It is not yet clear whether any Headon Hill Formation clay is present in situ, or whether all the material seen was excavated and dumped on the beach at one time. It is clear that the Headon Hill Formation clay, probably the calcareous green clay, was used for pipes and bricks. On the old Isle-of-Wight, British Geological Survey map the locality is mapped as on the the Headon Hill Formation. 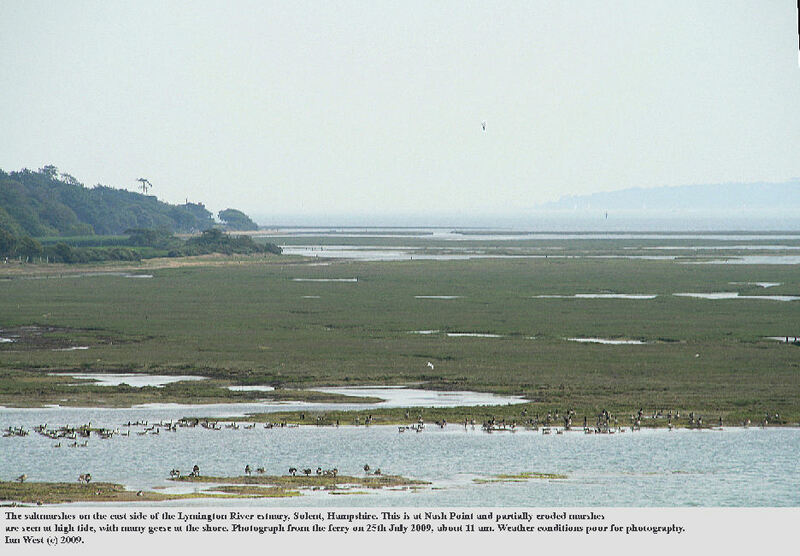 Pitts Deep is a pleasant coastal area of the West Solent, not far to the east of Lymington. It is a nice but private environment, with no public access. 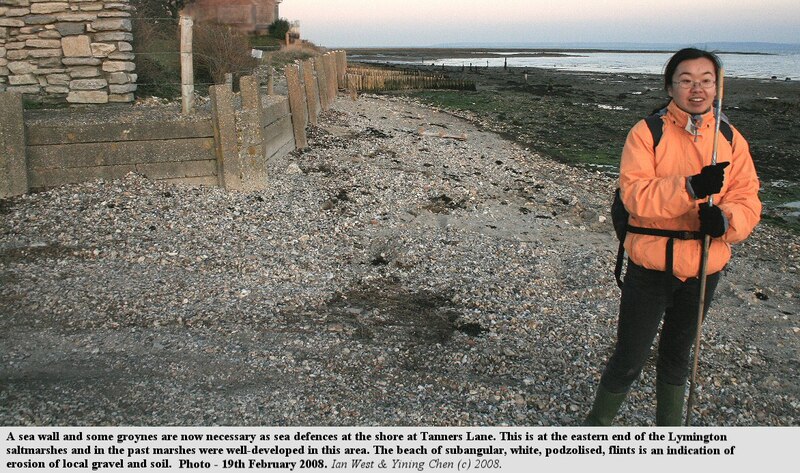 However, not far to the west is Tanners Lane, where there is access (details of this are also given here). 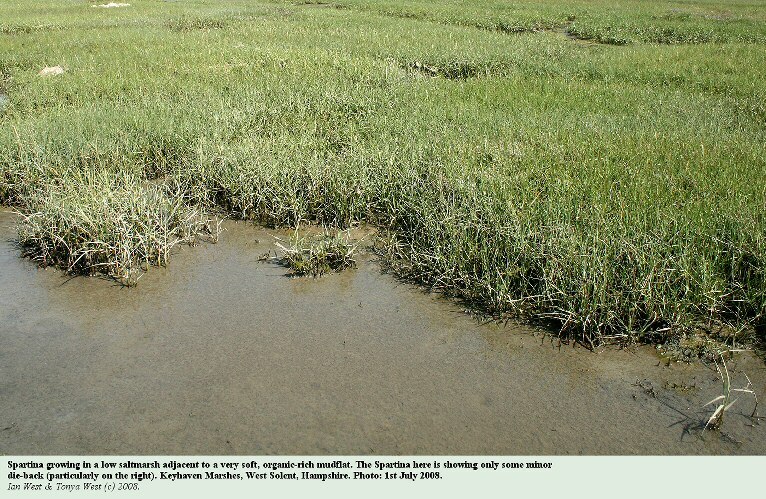 Generally the shore conditions are good in normal weather at Pitts Deep, and in the past there was much additional protection given by Spartina saltmarshes. Prior to about 1900 mudflats, not saltmarshes bordered the shore. After introduction of the plant in the Beaulieu estuary by Lord Montagu it spread in the area and the marshes reduced wave action and erosion and also accumulated sediment [sedimentation is quite fast on the marshes, and the accretion rates are between 1 and 2 mm per annum; the Chernobyl radioactive incident has provided a permanent marker in the Southampton Water marshes and the radioisotope is presumably present in all the Solent saltmarshes]. At Pitts Deep, there was a relatively deep channel normal to the shore and thus a good route for small boats to come in to the coast. At this locality there were clay pits into the Headon Hill Formation (Upper Eocene). 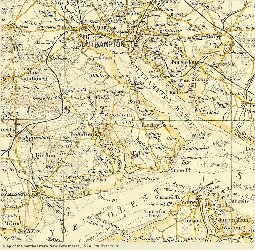 There was a brickyard and apparently some archaeological evidence of the reduction of siderite (ferrous carbonate - iron ore), which occurs in the region. It is rather puzzling that there were clay pits at such a low level, only a few metres at most, above sea level. They must have been subject to sea flooding at times. The name, of course, comes from the clay pits and the deep channel. 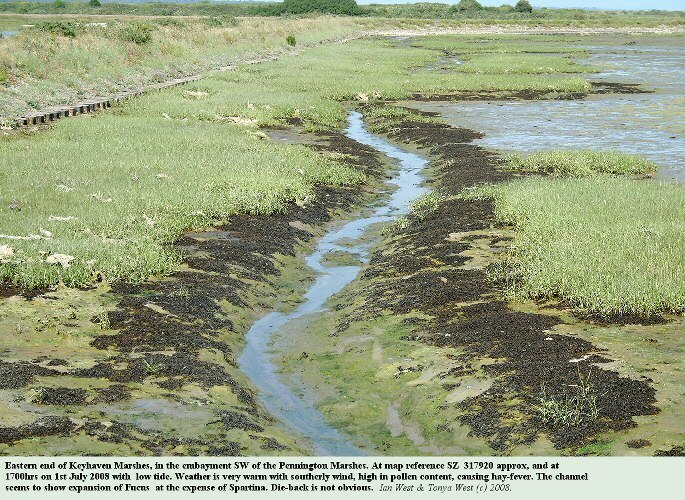 Now the saltmarshes are in decline and the channel is no longer well defined. 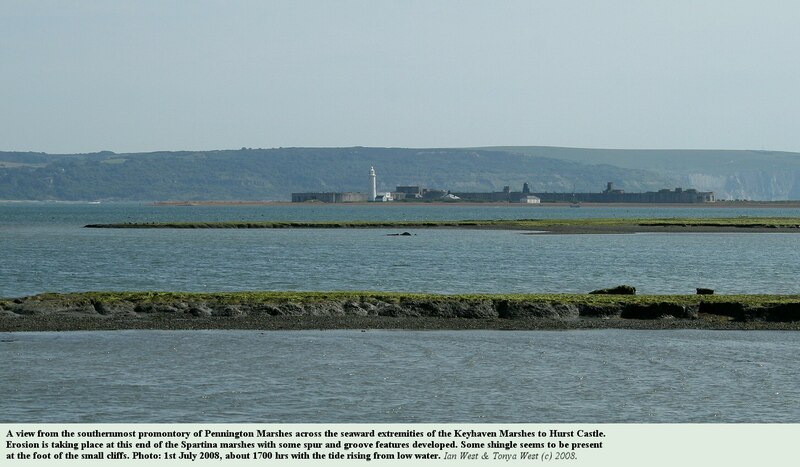 Some local coastal protection has been provided in the form of Portland Stone rock armour, but this is very limited. 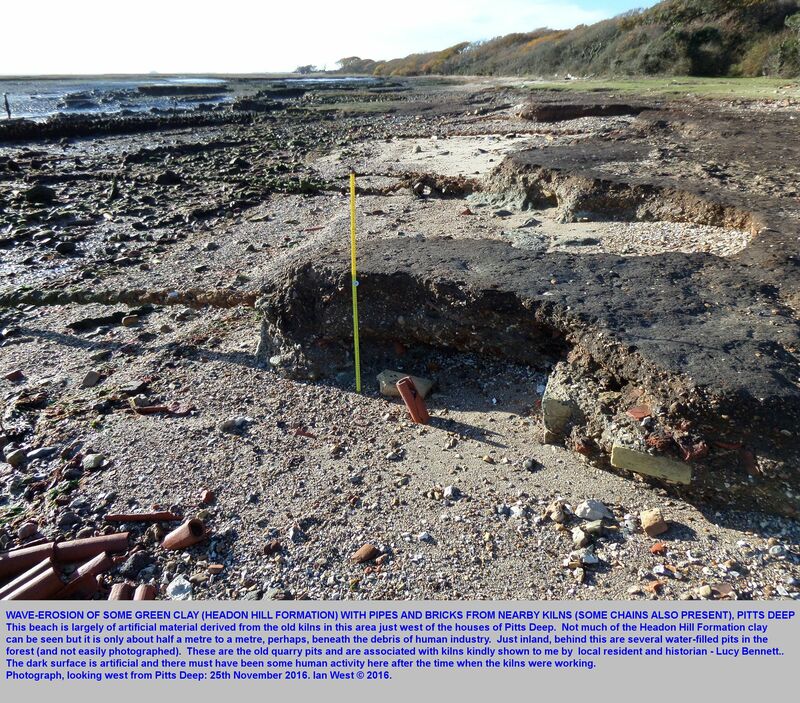 After partial destruction of the saltmarshes, there has been erosion of the beach, as is shown in photographs here. Pits Deep Aerial Photographs, 1946-2001. 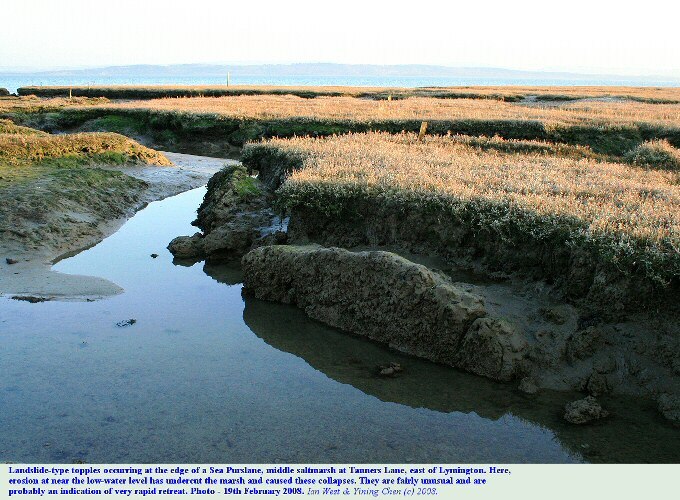 1946 - The salt marshes and the channels are well developed, but there is already erosion at the seaward side with very small, curved, white shell beaches developed on the outer edges of the marshes. 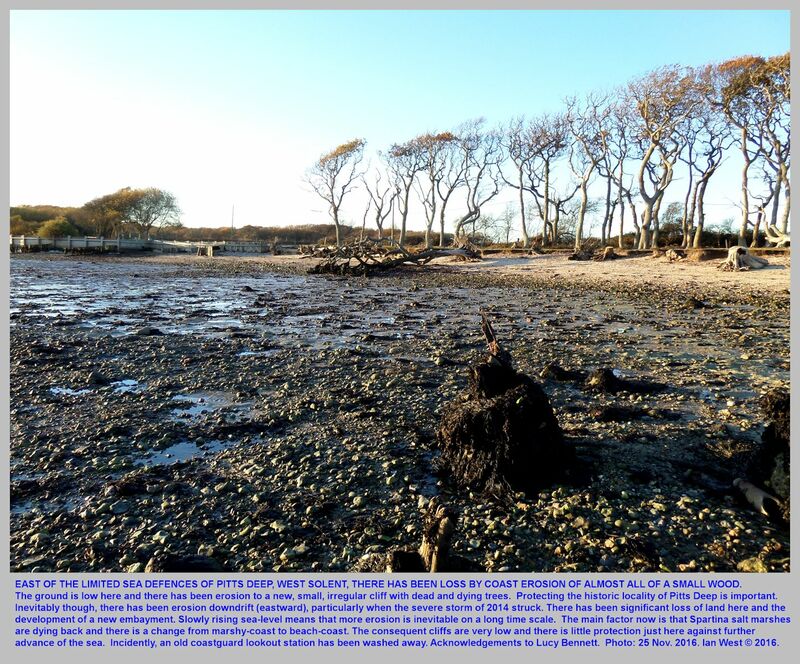 The houses at Pitts Deep are already very close to the coast but not specifically threatened. The saltmarshes are still sufficiently well-developed so as to give some wave protection, although they give an impression of having already diminished to some extent, especially near the shore south and southeast of Pitts Deep. Althought there is a channel further out, the deep channel does not seem to reach the shore at Pitts Deep (as it probably did when the quarry and brick-works was operating in the past). 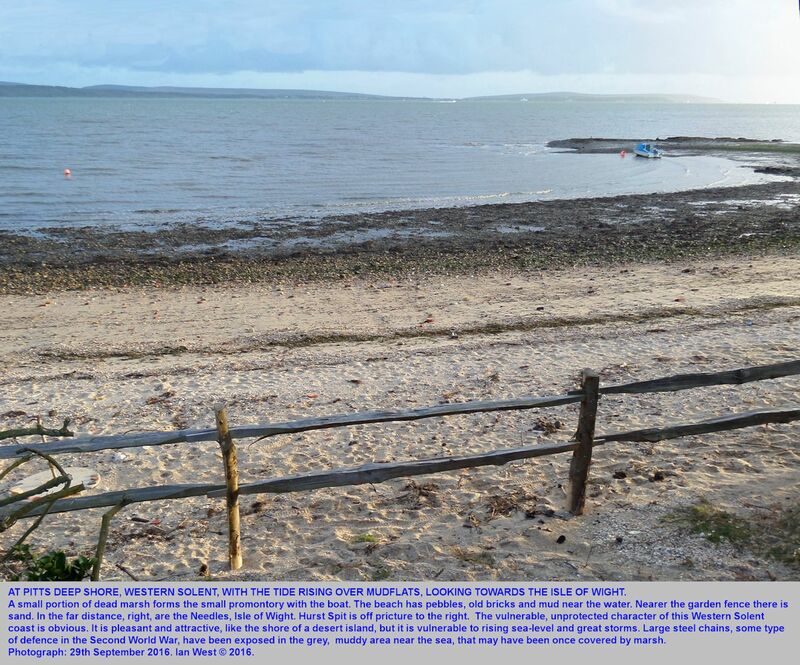 The shore beach is narrow and rather poorly developed, and with very limited beach shingle. 1954 - The outer edges of the salt marshes have retreated quite significantly. The main shore beach is now a little better developed. 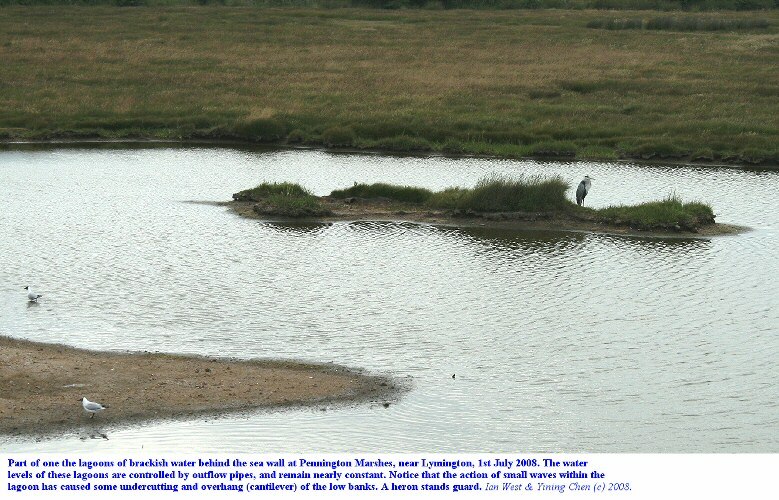 1980 - The saltmarshes have now been cut back to about two-thirds of their 1954 size. There is a wider white beach at Pitts Deep. 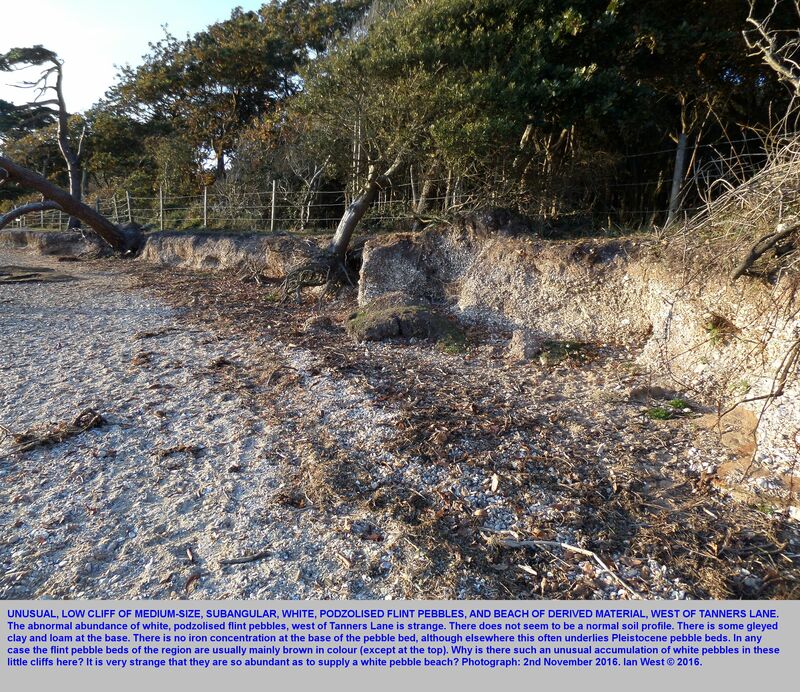 There has been substantial cliff erosion just to the east of Pitts Deep and the pebble material has led to a build-up of an enlarged, almost spit-like beach a short distance to the east of Pitts Deep. 2001 - The saltmarshes are in further decline. Erosion has been centred on the cliffs just east of Pitts Deep, providing much beach shingle further east. Storm of February 15th 2014 - continued. (with regard to old aerial photograph data). "Note that all the trees around our cottage, many now are gone as they were so damaged or felled in the the 1914 storm. We cleared the front of the cottage because we wanted to see out, and there was so much sea debris caught in the vegetation." 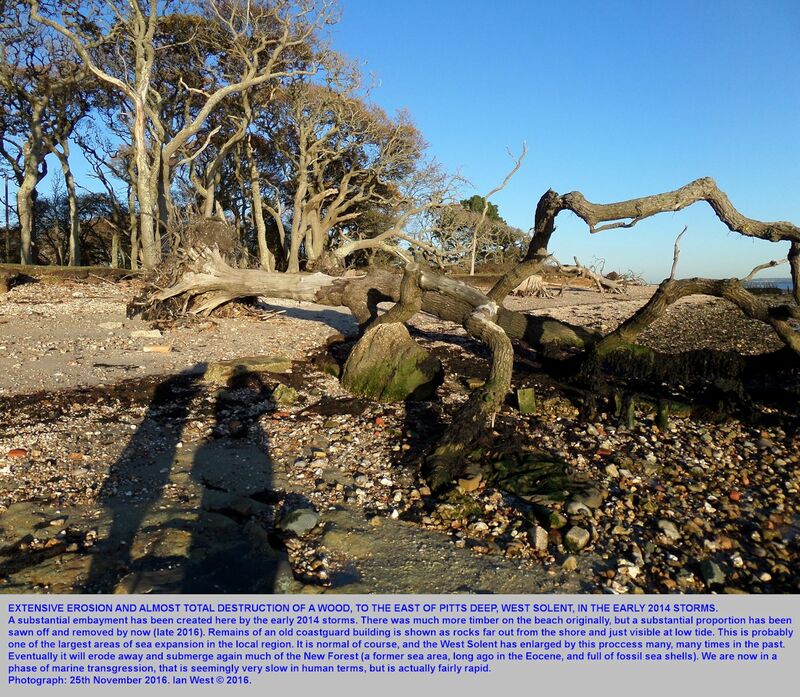 This was the St. Valentine's Day storm in which Hurst Spit was seriously damaged and had to rebuilt. the end of the spit retreated in the area of the old landing place (at the eastern end). 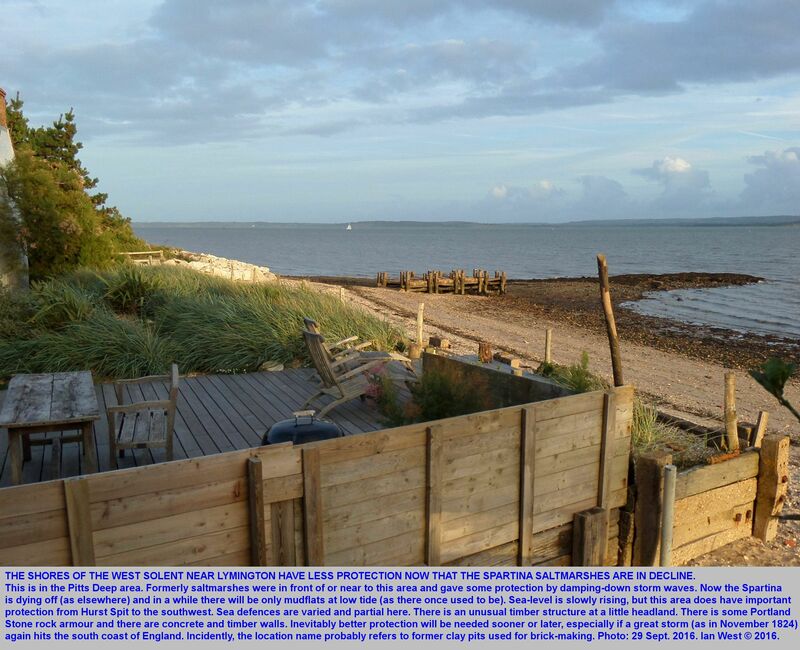 About 600 beach huts were damaged or destroyed at Milford-on-Sea. 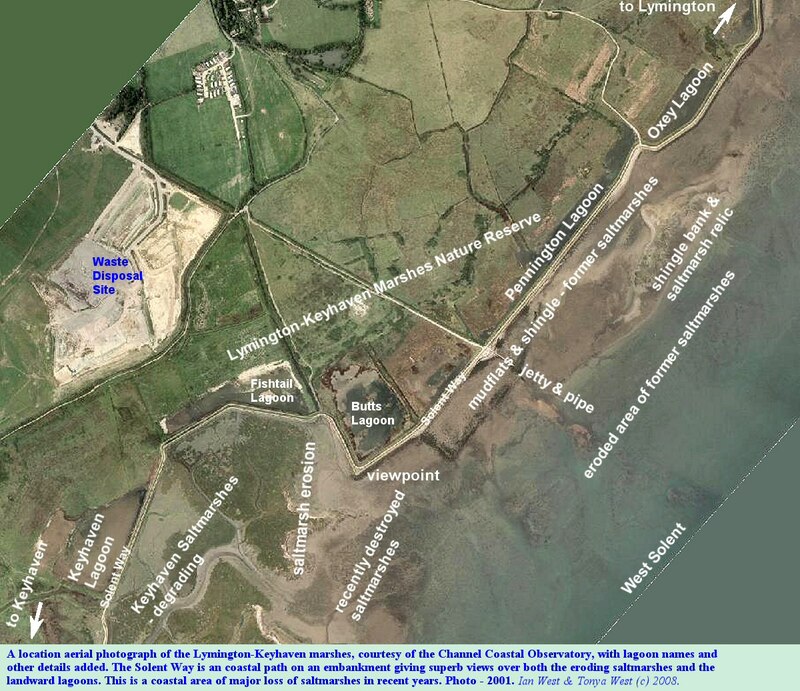 Details are shown in the Hurst Spit and Milford-on-Sea webpage in this website. 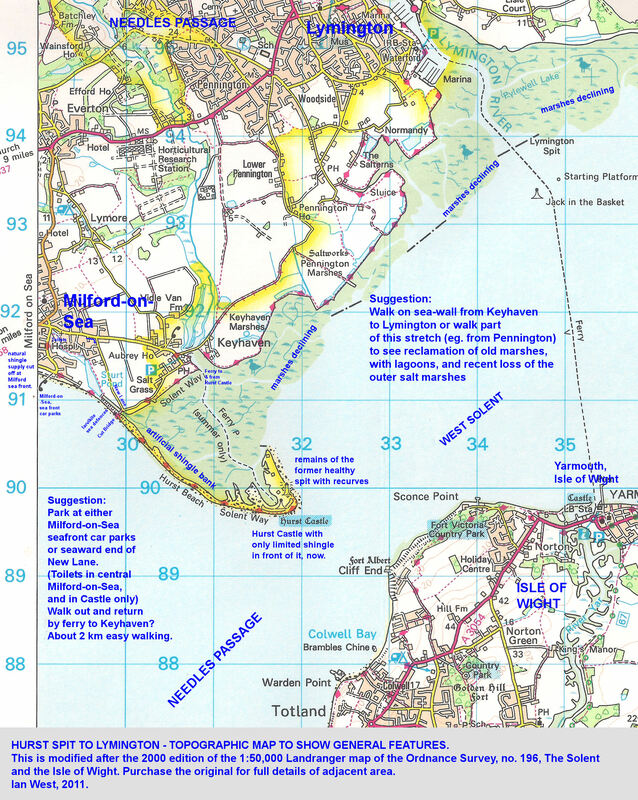 Hurst Spit and Milford Webpage. 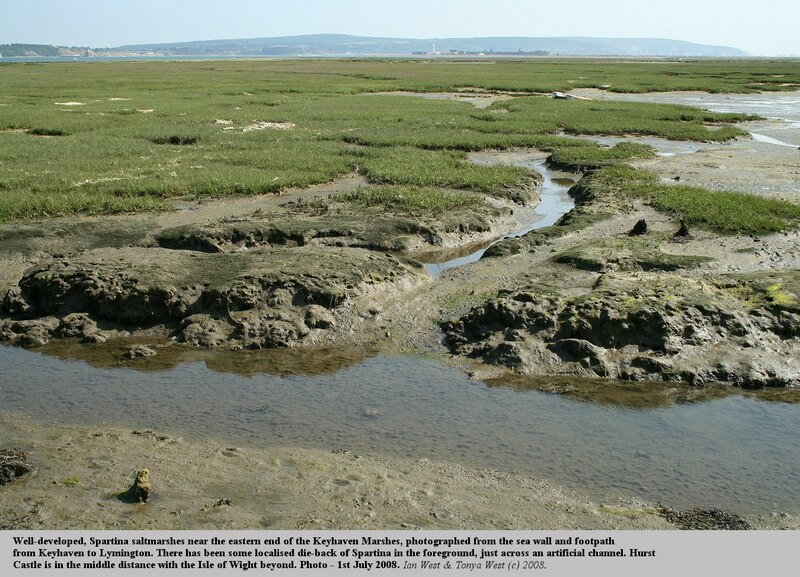 The Lymington Saltmarshes, east of the town are undergoing degeneration and erosion. This, as mentioned above in relation to Tanners Lane. The same problem exists, to some extent, to the west of Pitts Deep (map ref: SZ 364953). The Pitts Deep area is strictly private and there is no public road access. 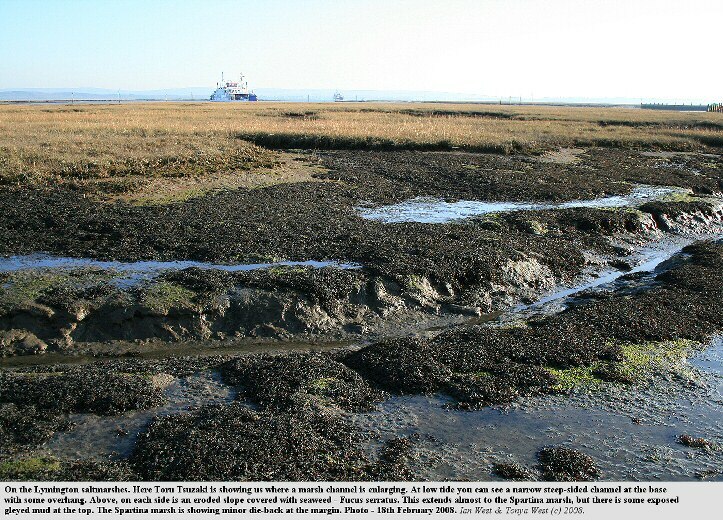 Theoretically it might be possible to walk there at low tide from Tanners Lane, but this would not be easy with risk of becoming stuck in mud. Some images of the Pitts Deep area given here. Pitts Deep is unusual. 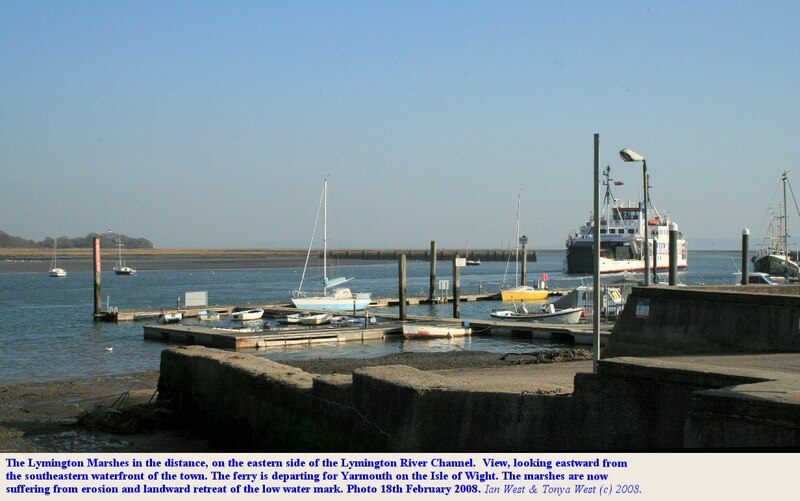 In historic times there has been a channel and minor port here (and also a coastguard station). 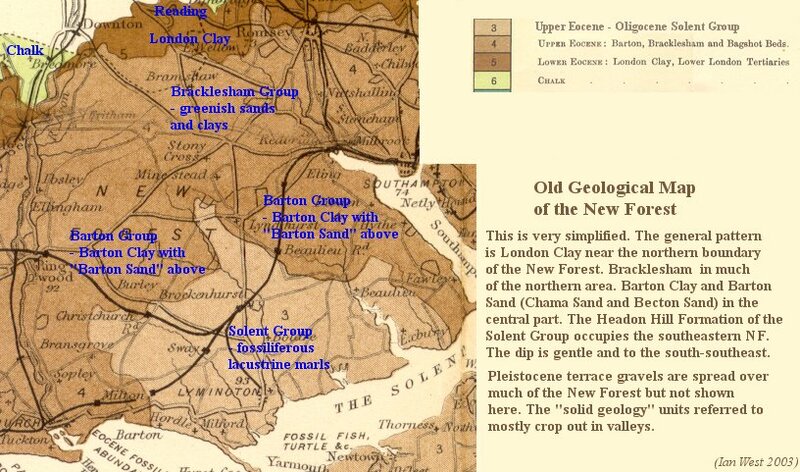 Part of an old geological map of the old quarry here, working both Pleistocene flint gravel and also (beneath) clay from the Headon Hill Formation (late Eocene). 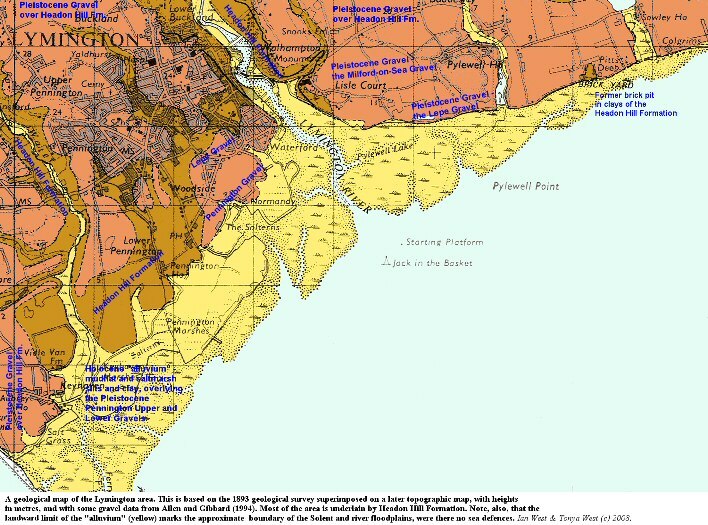 See the enlarged part, shown below, of an old geological map. The former exposure of the Headon Hill Formation here is entirely artificial and results from the removal of the gravel within a limited area, and in part, deeper excavation into the clay. This was probably used for making bricks and there are many relics of these on the present beach. As at Tanners Lane there are problems of low ground only a few metres above sea level. Loss of saltmarshes and erosion of the beach is taking place. This is necessarily a fast process, but some protection from the sea (of the West Solent) is needed here. Thus there are some groynes, some sea-walls and some rock armour here. Erosion of the beach has revealed numerous bricks from an old brickworks here. Also there are some very large and rusty chains. 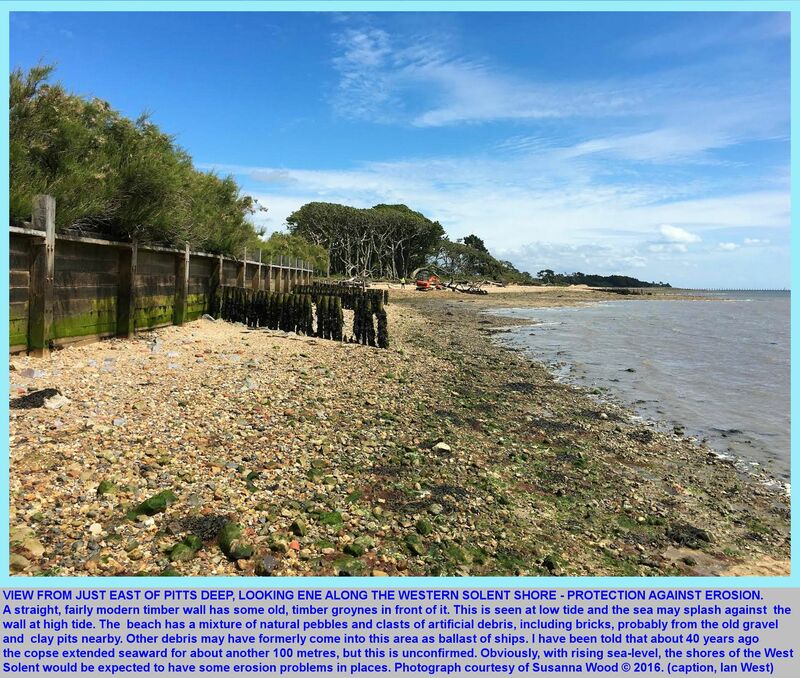 They resemble features seen at other beaches used in the Second World War, but their origin is uncertain and they might be older. Archaeologists working in the area have found some siderite [iron carbonate] that might have been used in old, small iron-works here. 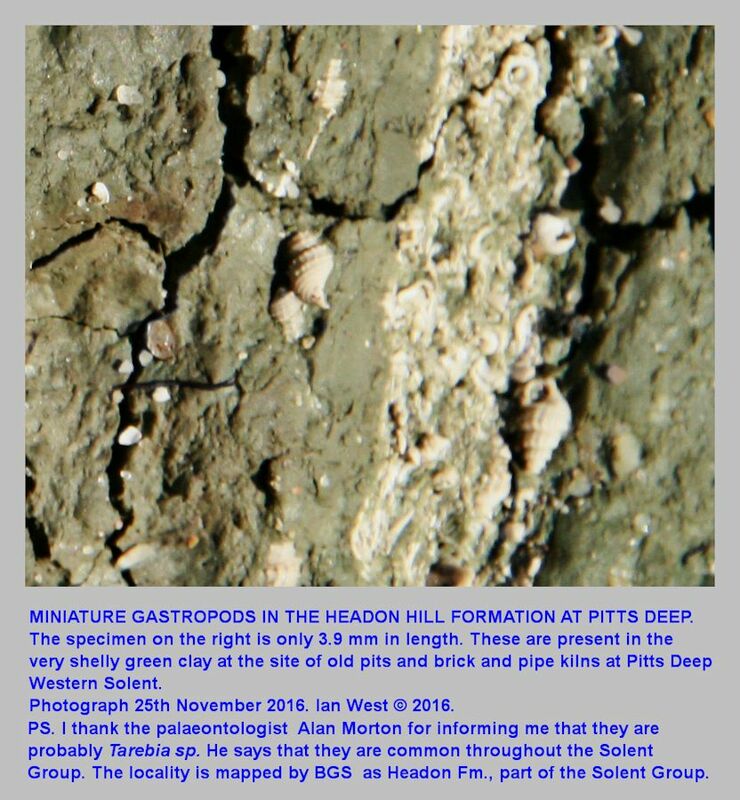 There are several uncertainties at Pitts Deep because it has been a working quarry and a small port in the past. 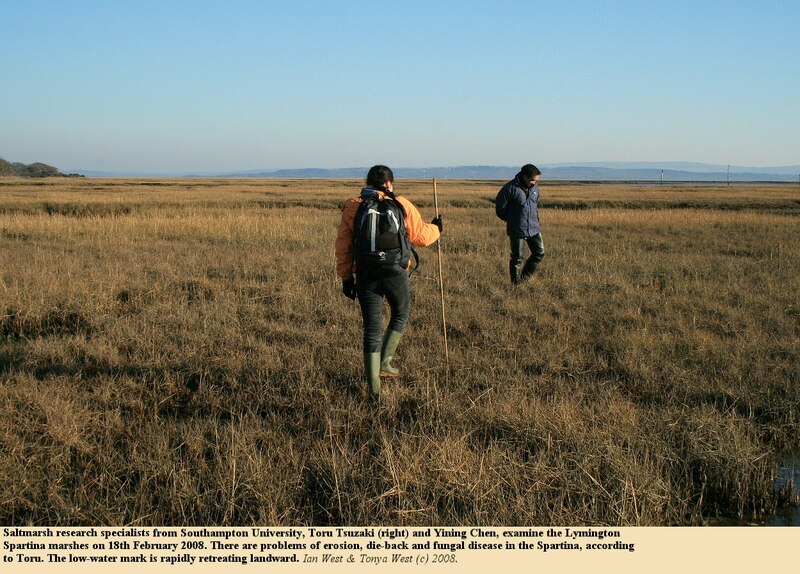 At a later stage than that shown on the map above, the growth of Spartina anglica commenced in the area and progressively spread. 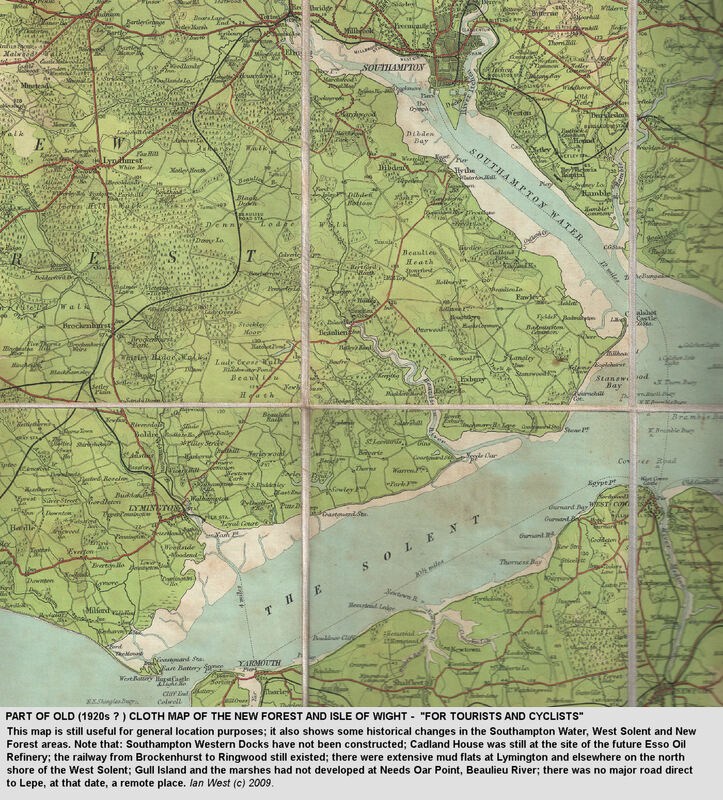 Spartina salt marshes are shown bordering the West Solent on the modern maps; however, on the older maps this is just marked as mud-flats. Pitts Deep in particular was a channel from the open water of the Western Solent through the mud flats and thus reaching the site of the old quarries or pits. 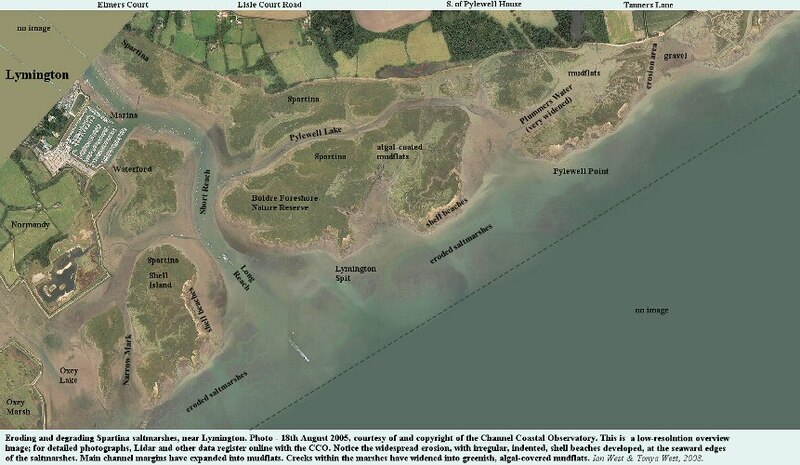 The channel does not seem to have retained its original position after the marshes (as opposed to mudflats) developed. The original Pitts Deep channel is not there now. 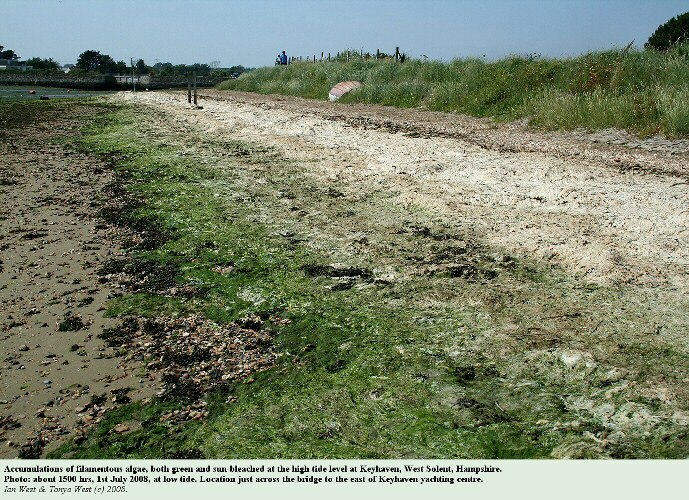 Much filamentous algae of Enteromorpha type has been washed up at the landward margin of the Keyhaven saltmarshes, as seen in early July 2008. It is still green on the seaward side of the accumulations but is bleached almost white on the higher, landward side. 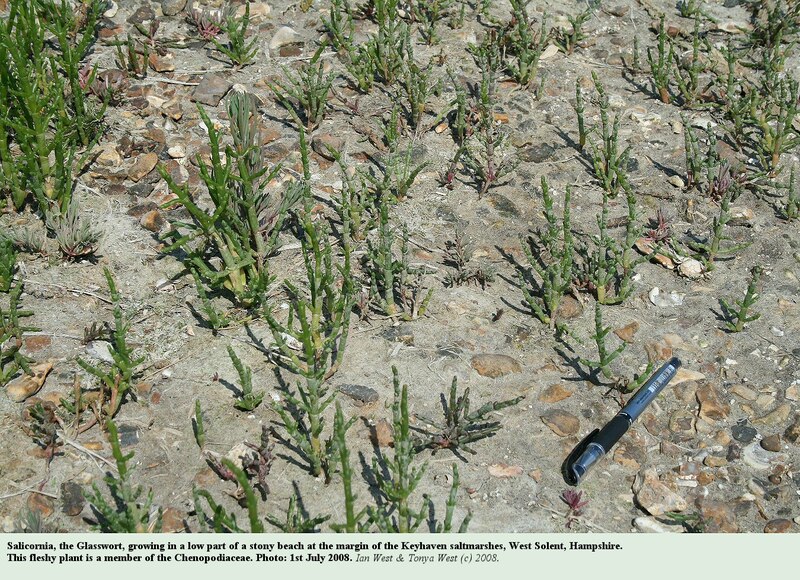 Much Enteromorpha can be seen in situ on the outer mudflats and on channel margins of the Keyhaven saltmarshes, particularly where there has been erosion and destruction of Spartina marsh. Studland, Poole Harbour Side, webpage. At the time of the Olympics in China in summer 2008 there is a major problem with similar filamentous algae at Qingdao and it has become international news. 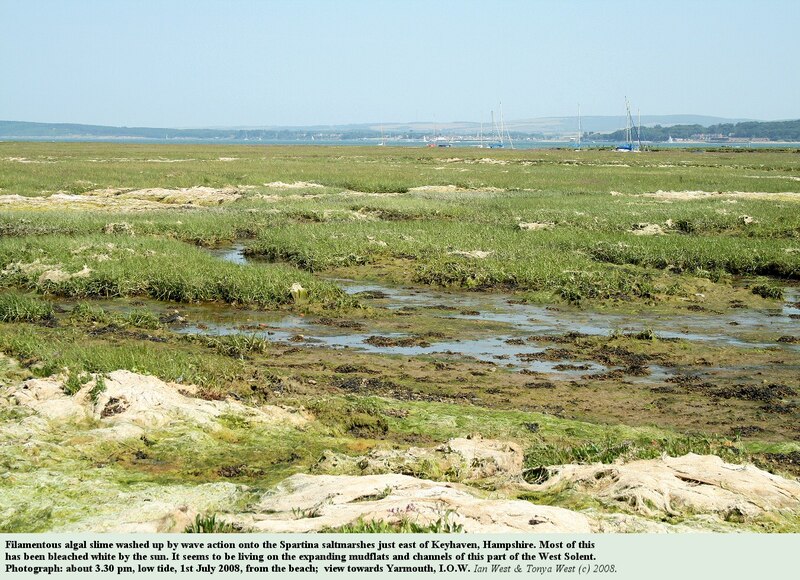 See the webpage Tackling Qingdao's Invading Algae. 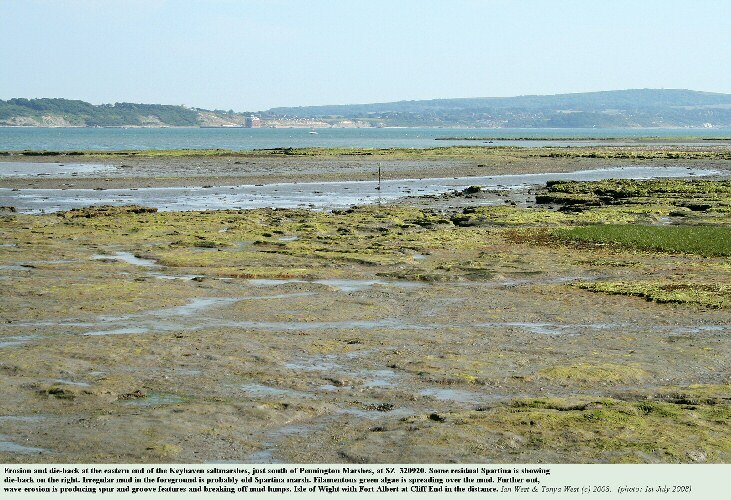 Thick green algae has overwhelmed the Qingdao coastline. It is knee-deep. 10,000 recruits of the People's Liberation Army have been deployed to remove it. 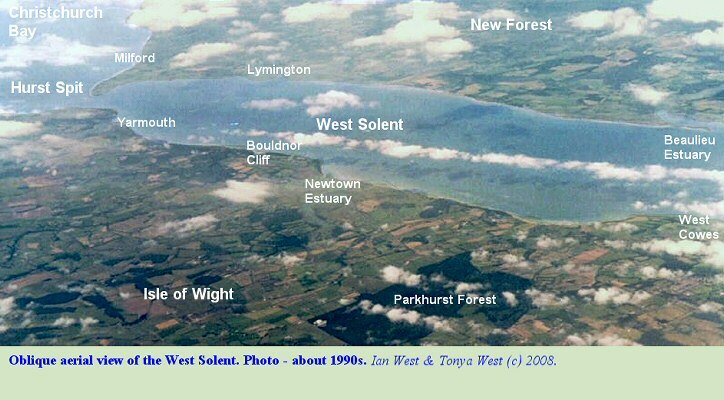 The mainland coast of the West Solent is changing from a varied coastline, originally with several small harbours and inlets in addition to harbours still surviving. 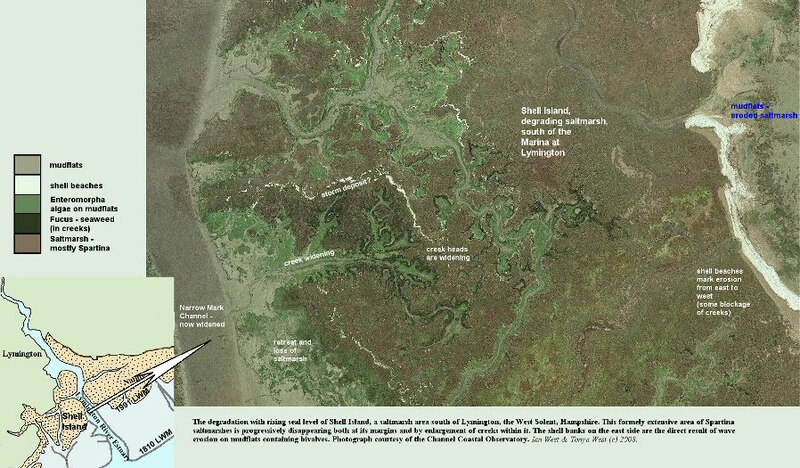 It once had extensive mud flats but in the 20th century extensive Spartina saltmarshes developed. These are now eroding and declining fast. 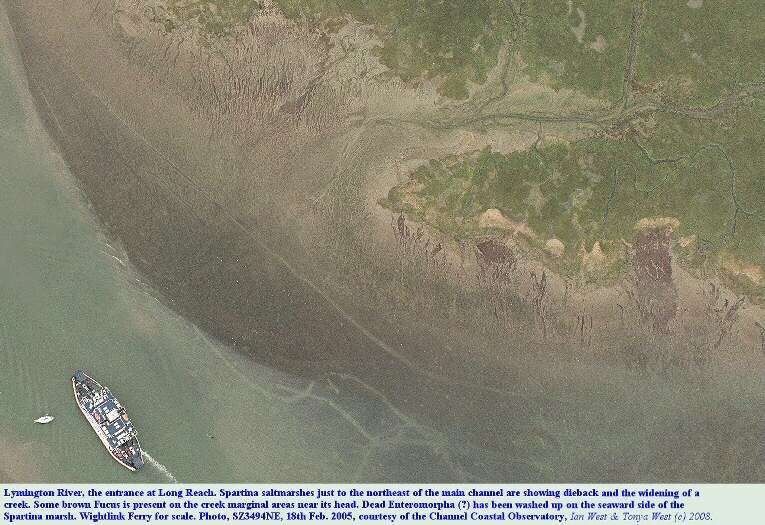 Mud flats have greatly reduced in width with coastal squeeze from rising sea-level (i.e. 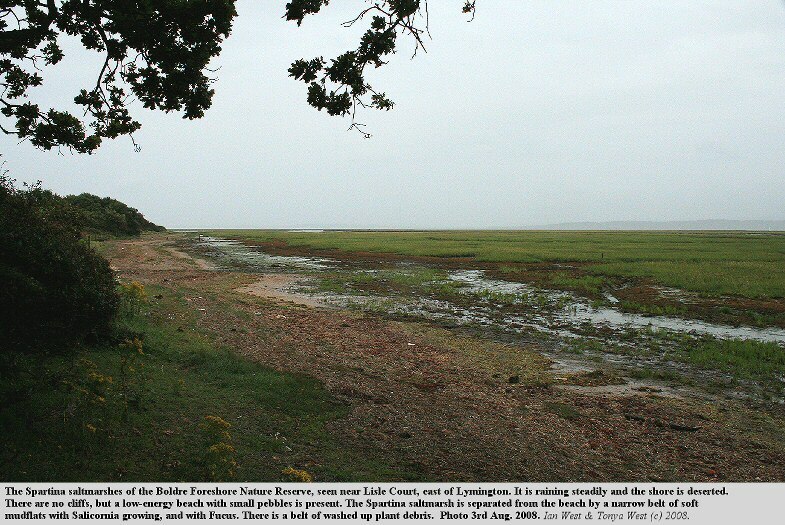 steepening shores - low water mark approaching high water mark in location terms). 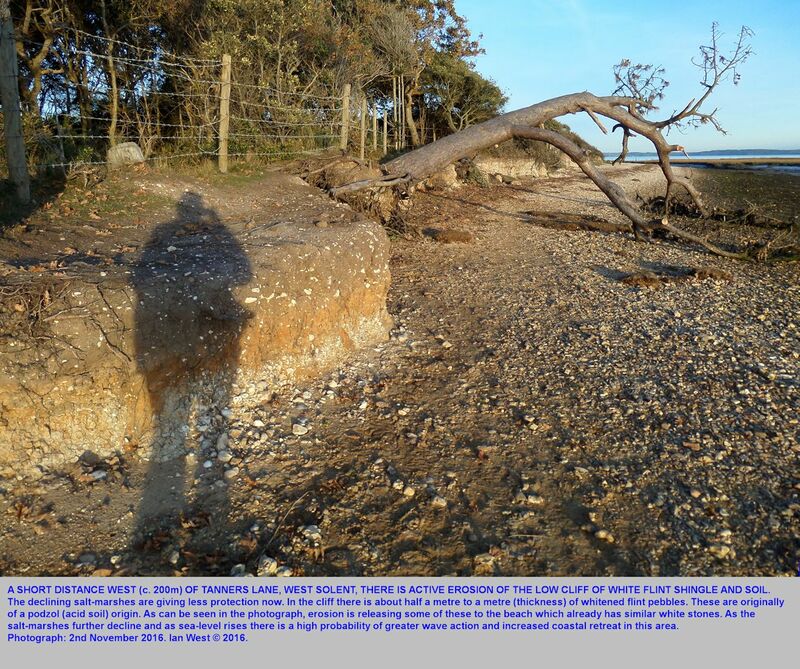 Cliff erosion on the north shore of the West Solent is limited now but is increasing and will increase greatly. 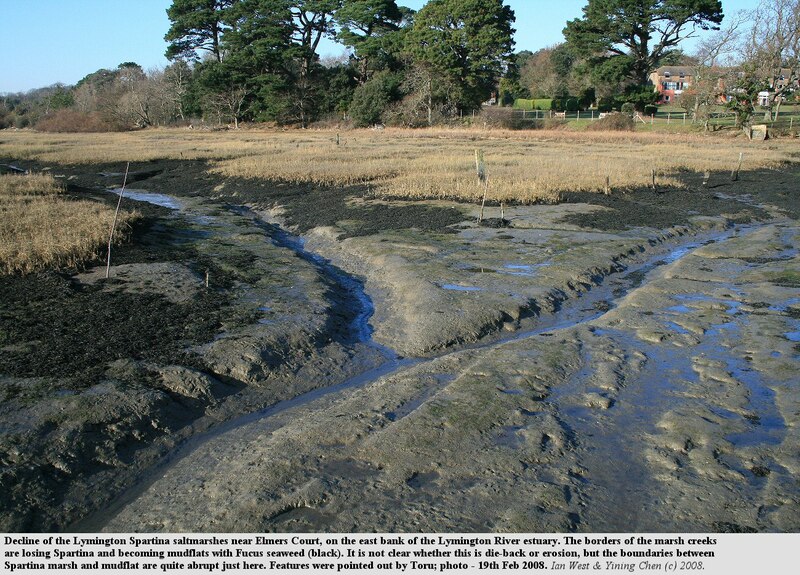 In particular, the saltmarshes east of Lymington will disappear and fresh cliffs of Pleistocene gravel will develop. Such cliffs will then provide masses of shingle which will move with longshore drift northeast into large spits. One of these will close or partially close the Beaulieu River mouth. 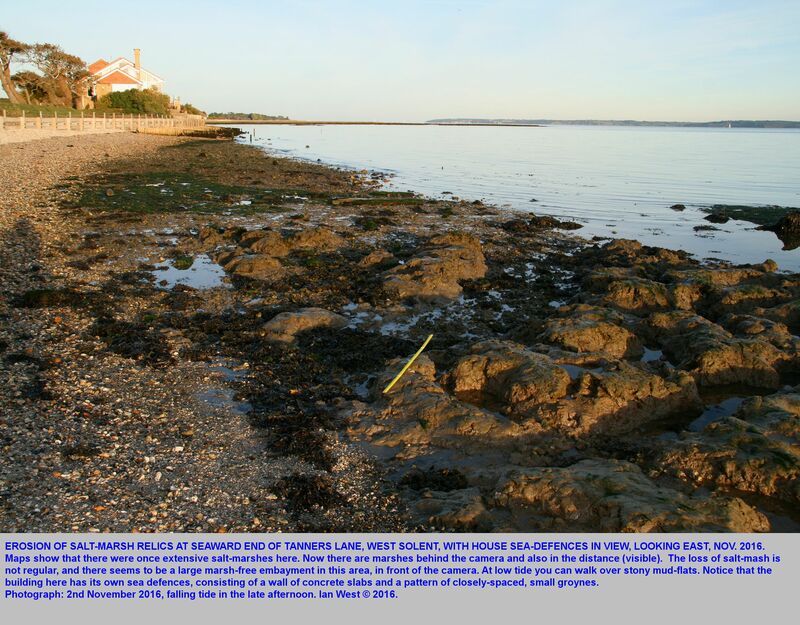 The north shore of the West Solent will become a coast of shingle beaches, somewhat like those of the Hayling Island, Bracklesham Bay coasts in the more open, Spithead region. This trend towards cliffs, shingle beaches and spits will happen in any case with rising sea-level. The change in this direction would be more drastic if Hurst Spit were to be destroyed by rising sea levels and hurricanes in the future. 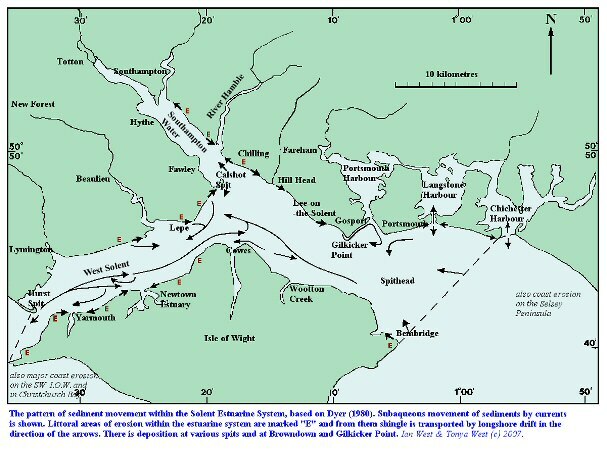 Bibliography of the Geology of the Solent - This is the main general bibliography of the geology of the Solent and adjacent area and is alphabetical by author. It is not divided into topics. References to publications are periodically added. It is not, of course, comprehensive and never could be. [Although, not updatednow, there is also a topic section below which has some additional references.] Use of the main reference list above is recommended. [Bibliography of Geology of the Solent - Topics Alphabetically Additional and incomplete list. I very much appreciate discussion in the field in past years with Professor Yining Chen, when she was a research student at Southampton University, investigating salt marsh plants and sediments. 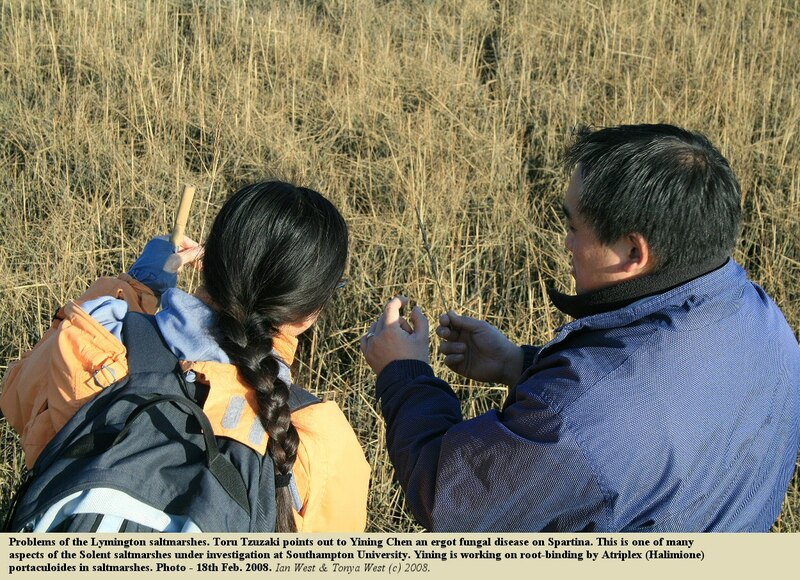 Help was also provided by Dr. Toru Tsuzaki, formerly a research student of Southampton University. Valuable information was kindly provided by the Beaulieu Estate and access kindly permitted to a certain area by the Exbury Estate. In particular, local residents made studies possible in certain areas, that are generally impossible to get to. 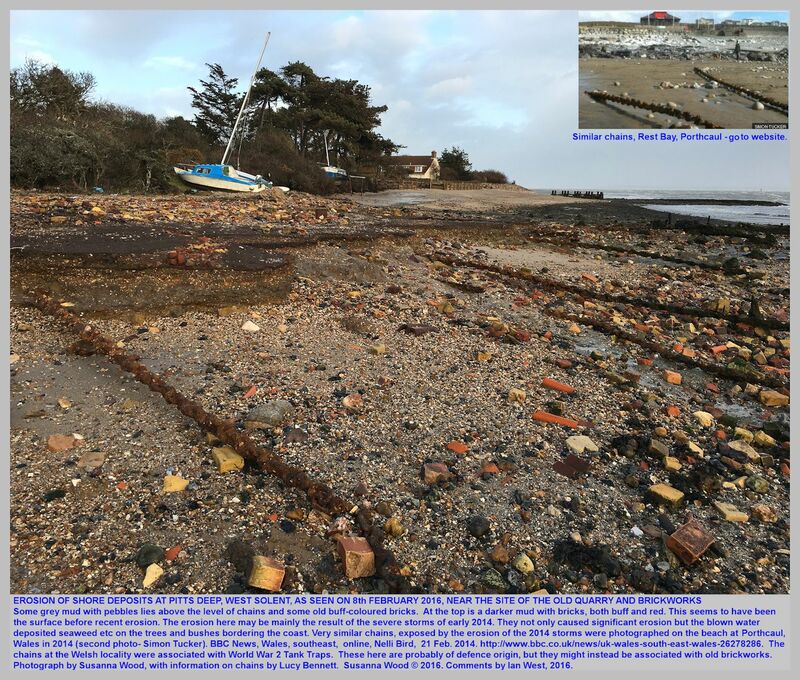 With regard to Pitts Deep and Tanners Lane I particular thank the very kind cooperation of Susanna Baird and Lucy Bennett, local residents and experts on the adjacent coast. 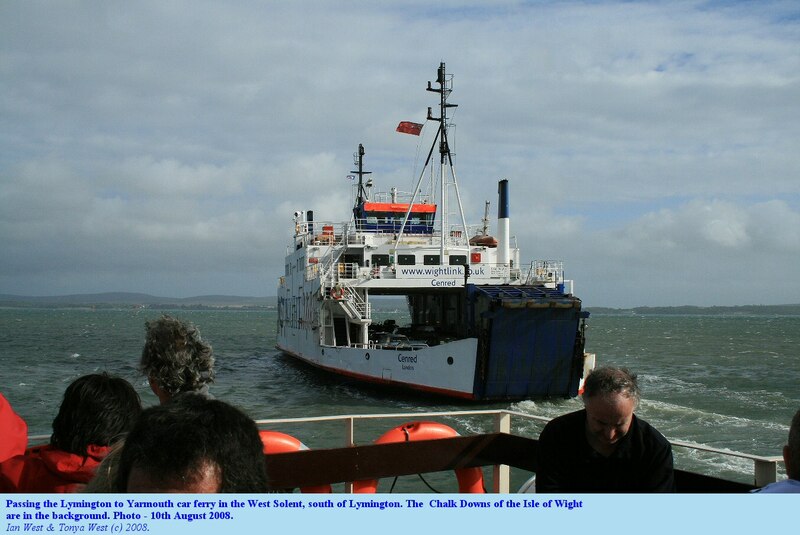 They very helpfully provided access and much local information. This was very valuable for the area which is not easily accessible to the public. I also thank them for photographs and local information. 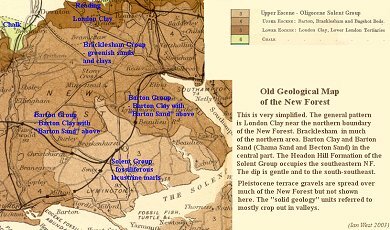 I also thank Dr. Frank Green, Archaeologist of the New Forest National Park for helpful information regarding the Pitts Deep area and the possible local use of sideritic ironstone at the old quarry works there. I very much appreciate the receipt of helpful historic information from Jeremy Greenwood. 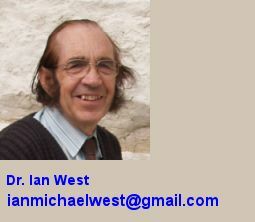 I thank Alan Morton for information on fossil identification. The support of the Faculty of Natural and Environmental Sciences, Southampton University is very much appreciated. Copyright © 2016 Ian West, Catherine West, Tonya Loades and Joanna Bentley. All rights reserved. This is a purely academic website and images and text may not be copied for publication or for use on other webpages or for any commercial activity. 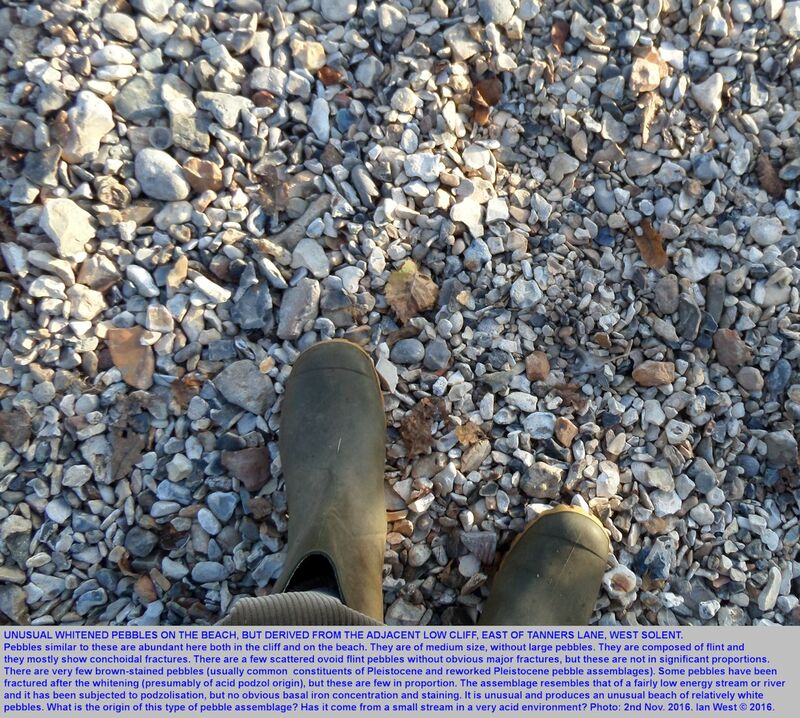 A reasonable number of images and some text may be used for non-commercial academic purposes, including field trip handouts, lectures, student projects, dissertations etc, providing source is acknowledged.